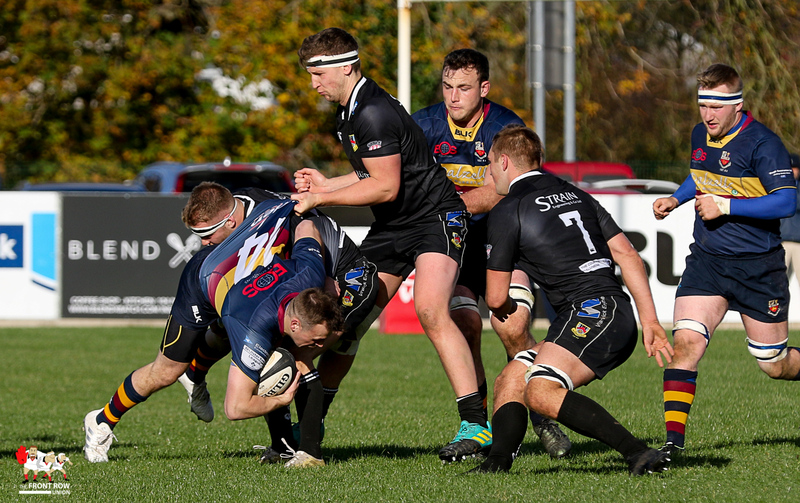 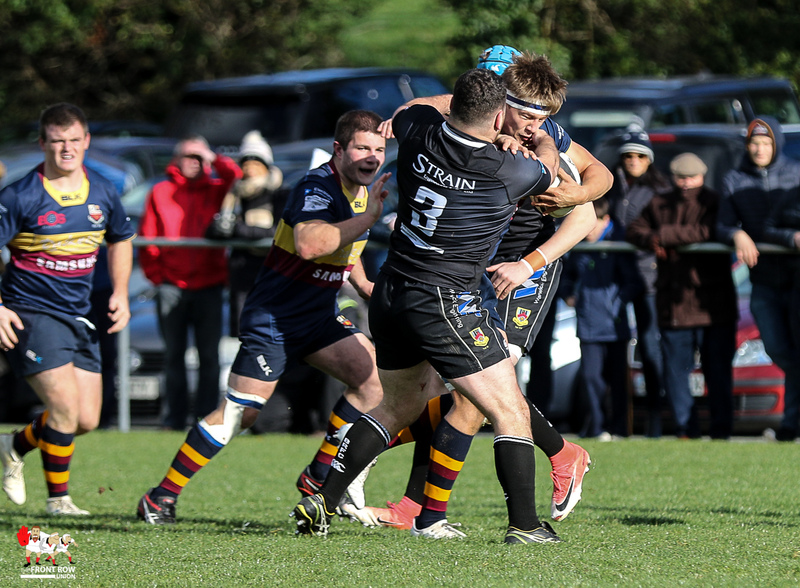 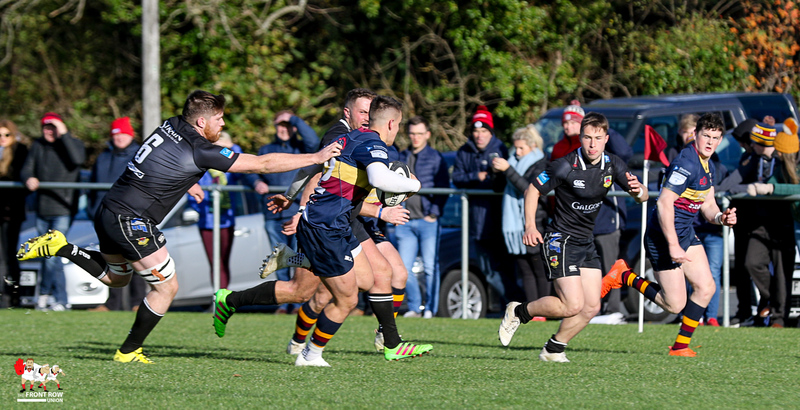 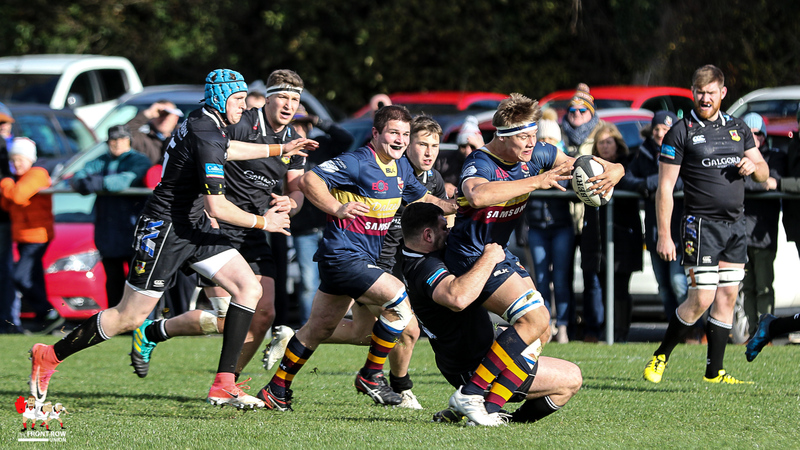 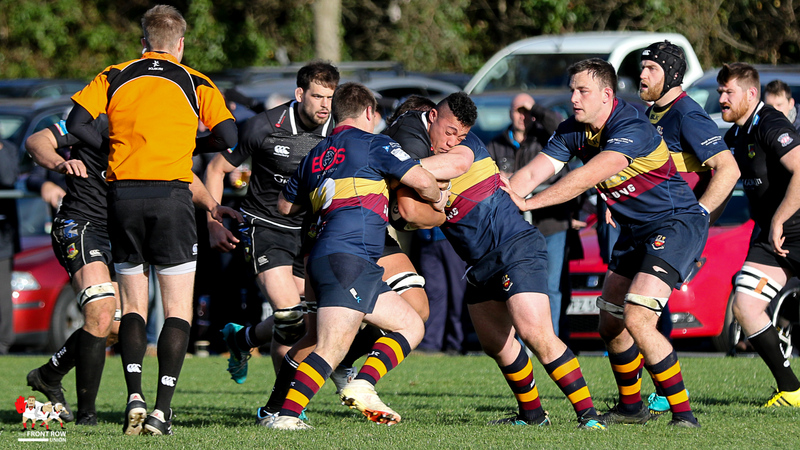 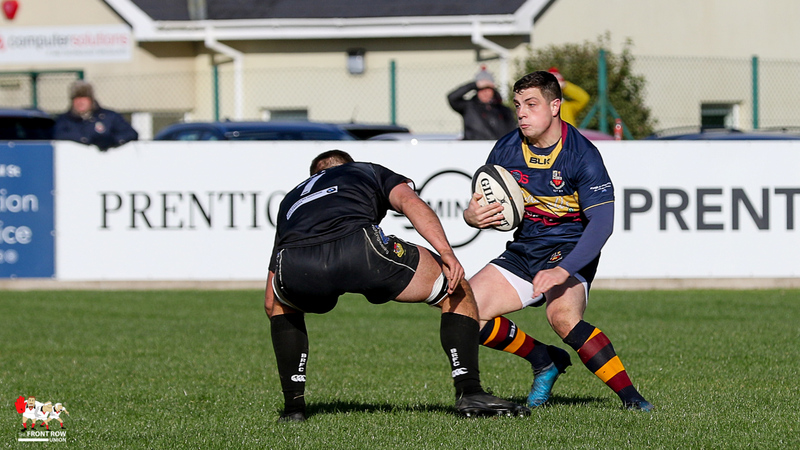 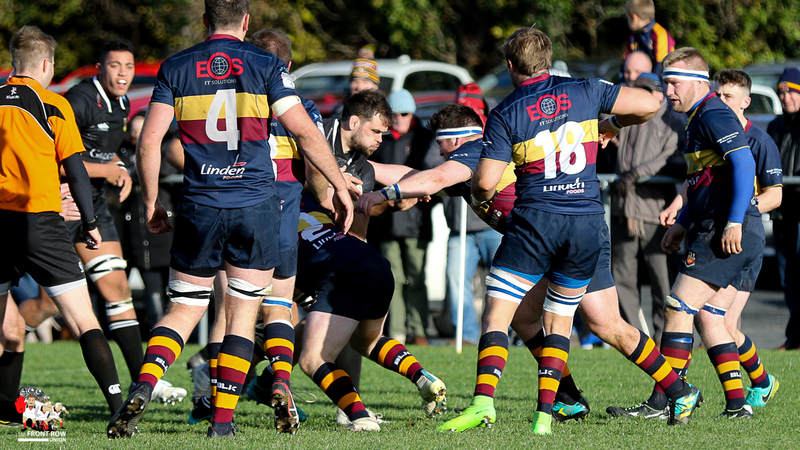 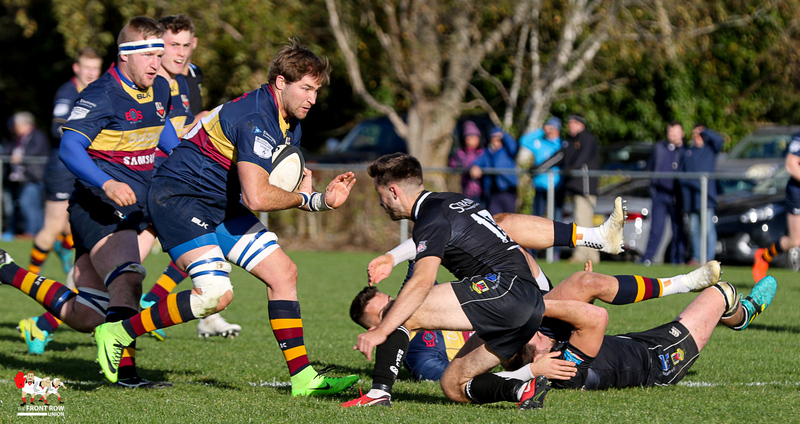 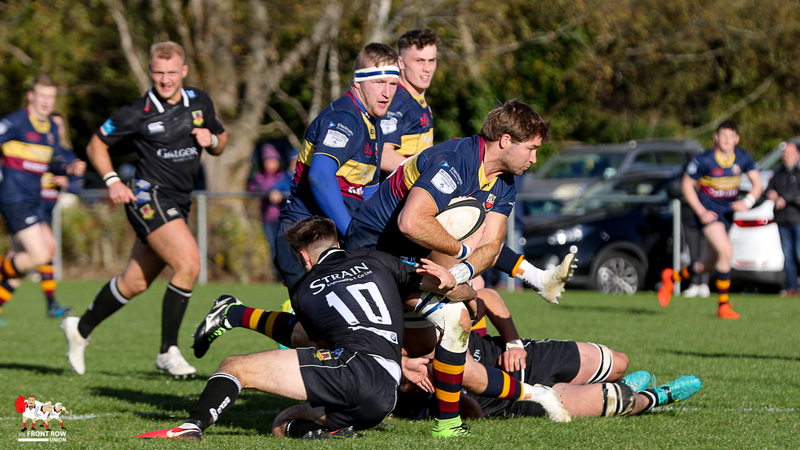 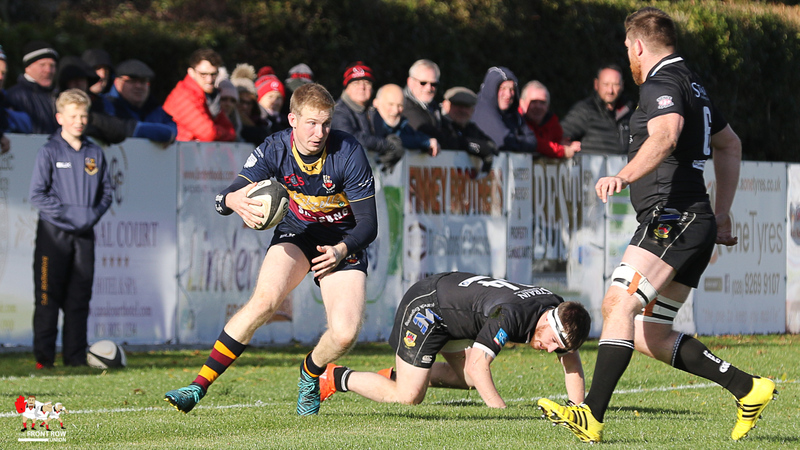 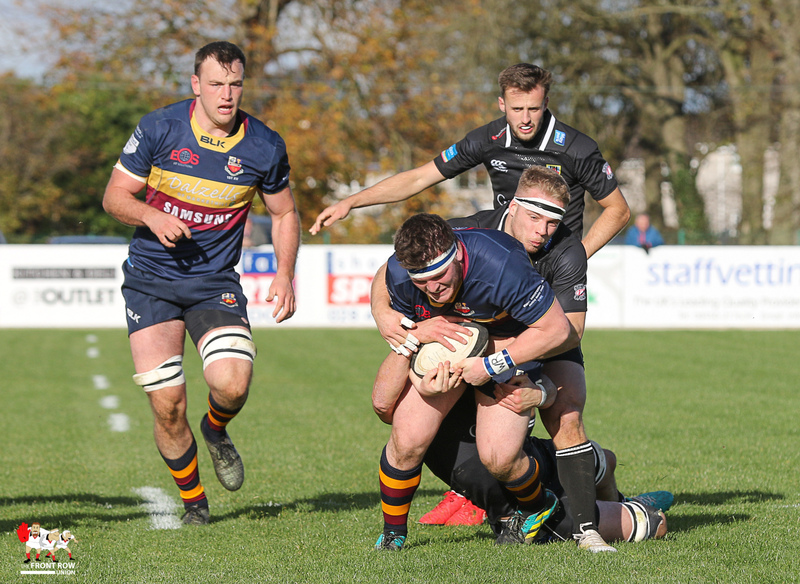 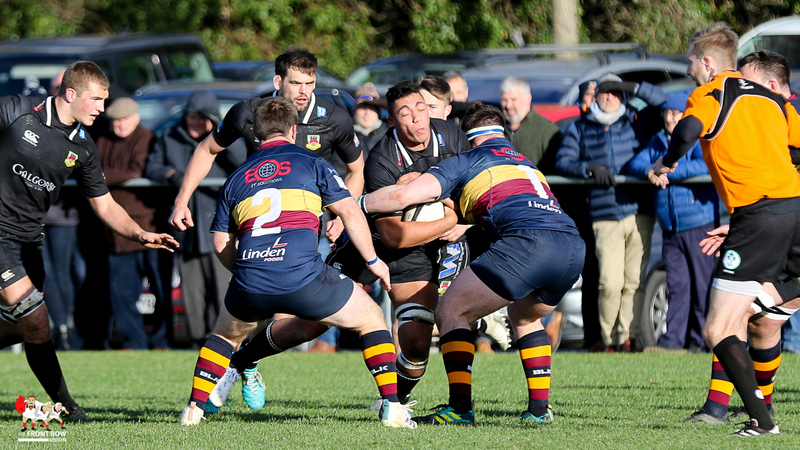 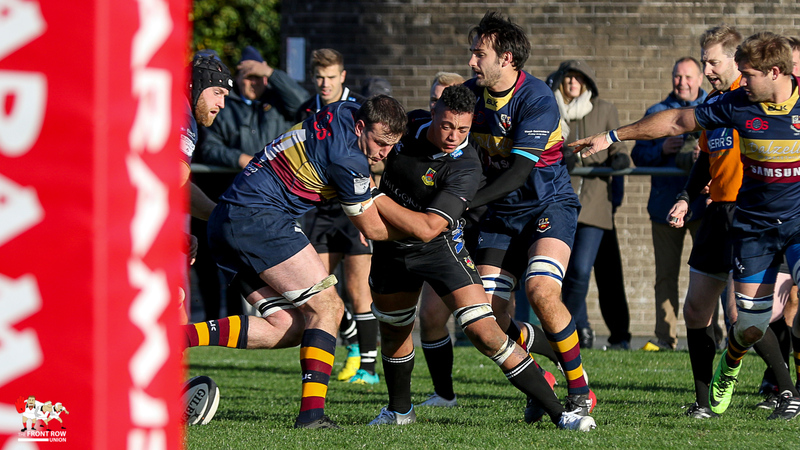 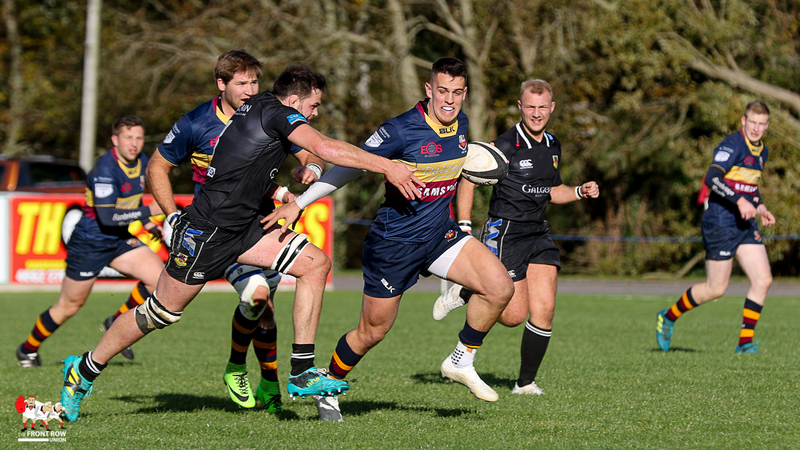 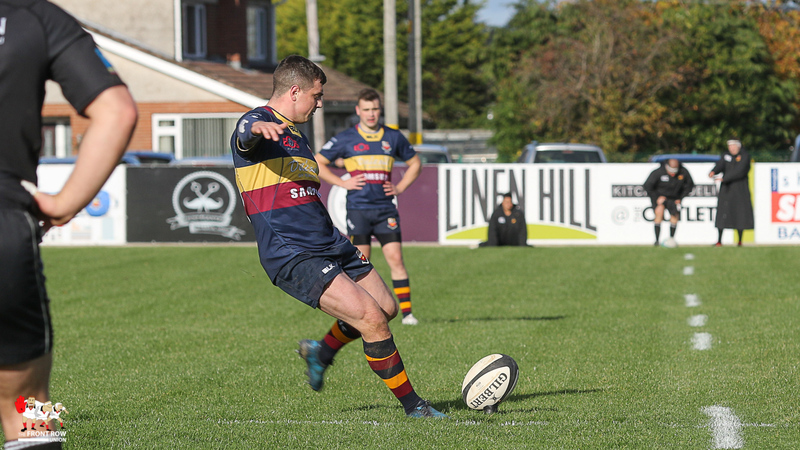 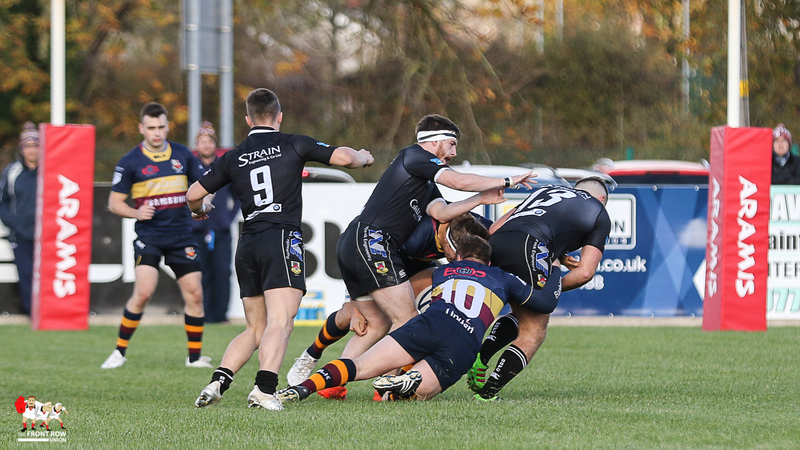 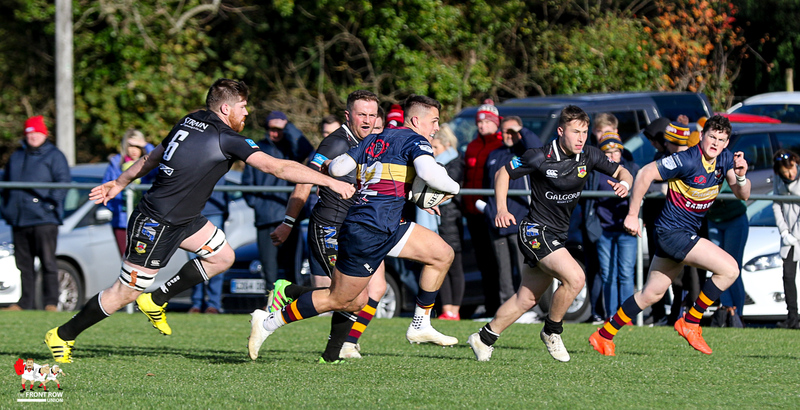 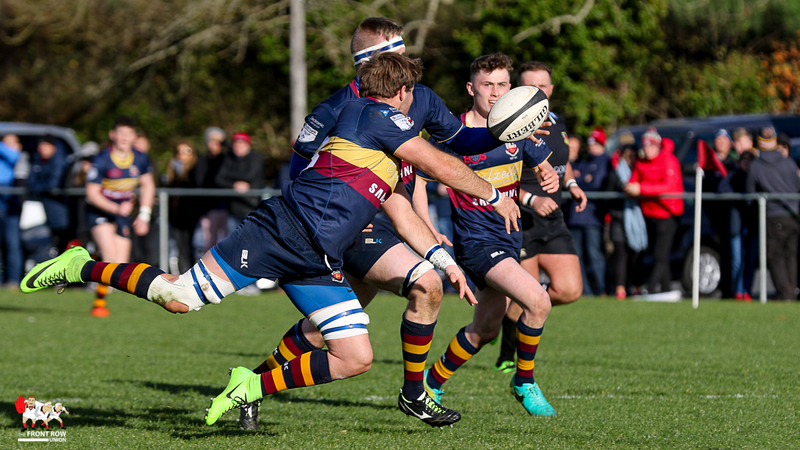 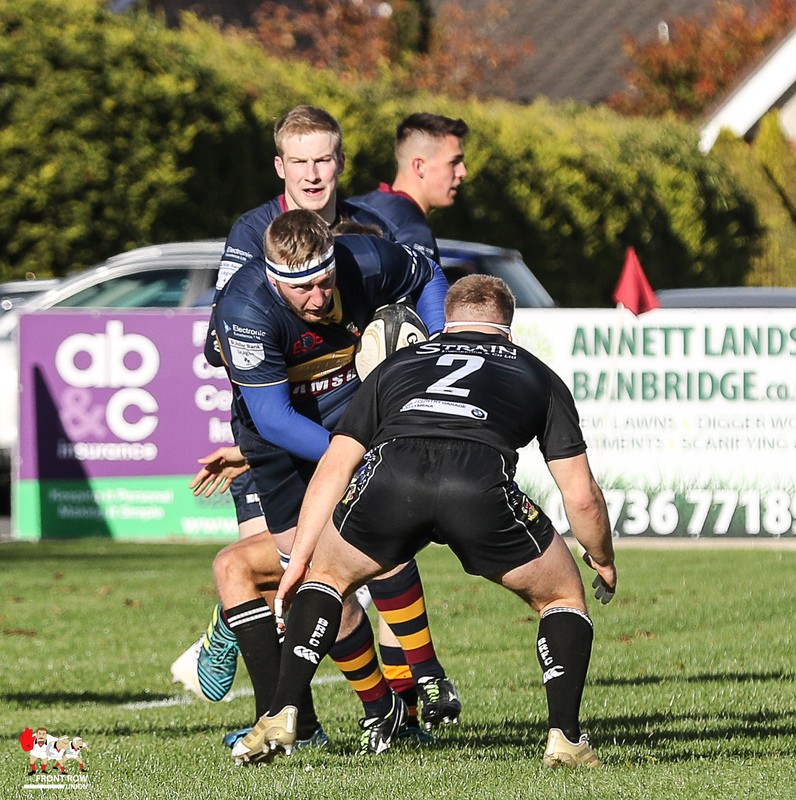 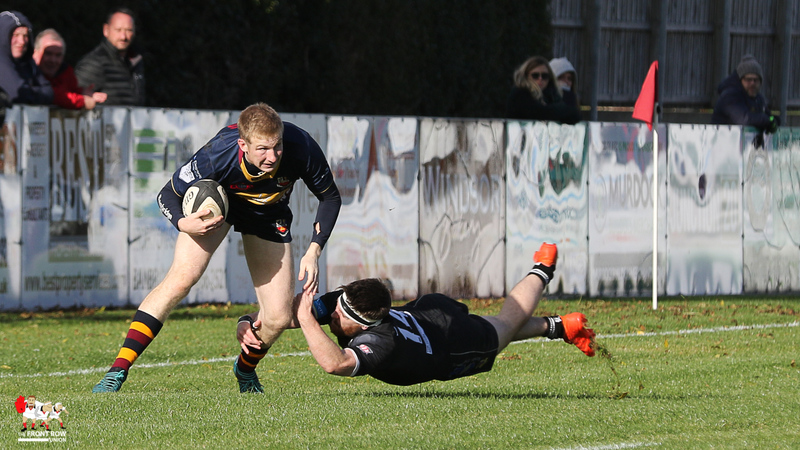 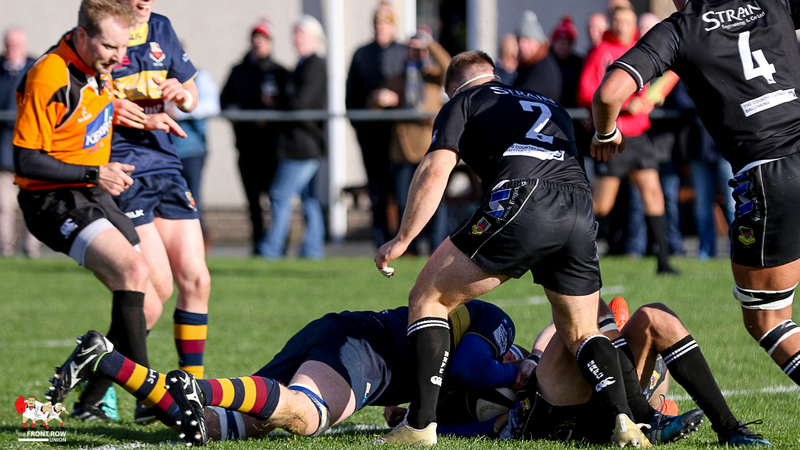 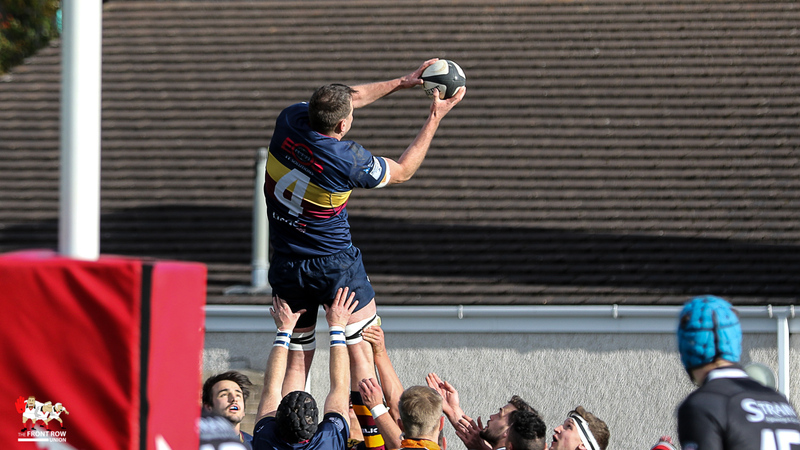 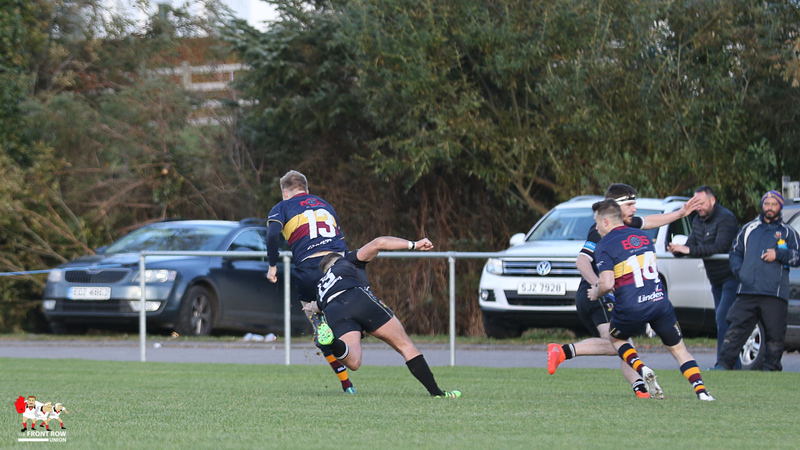 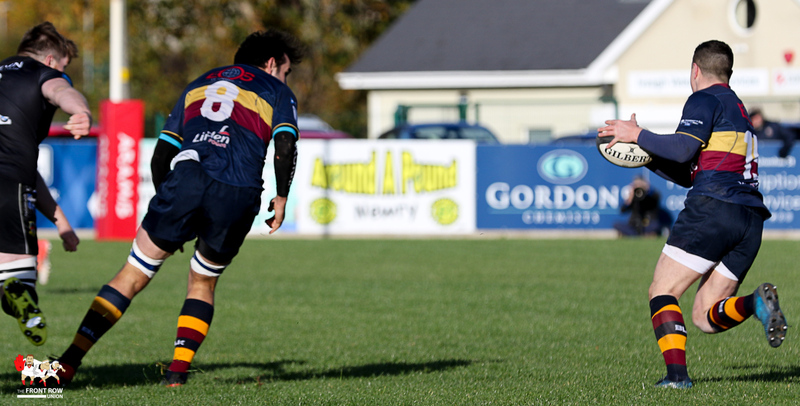 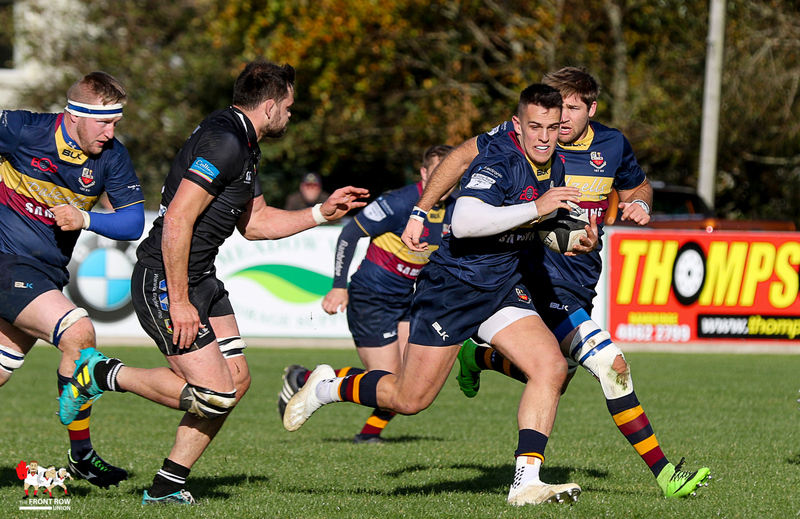 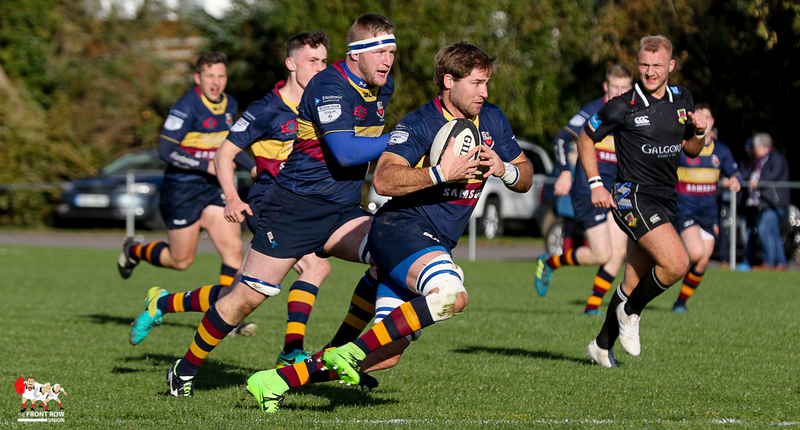 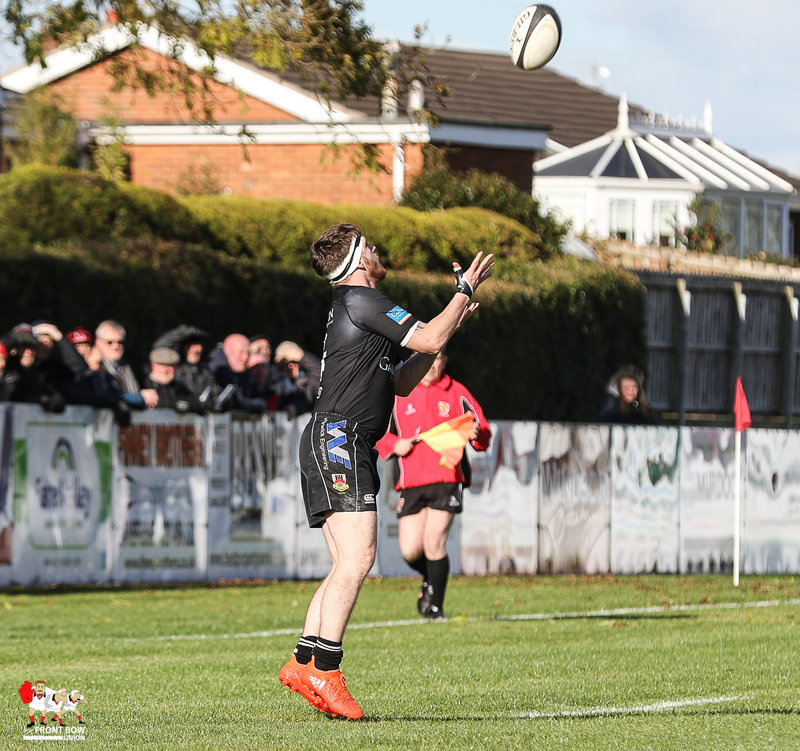 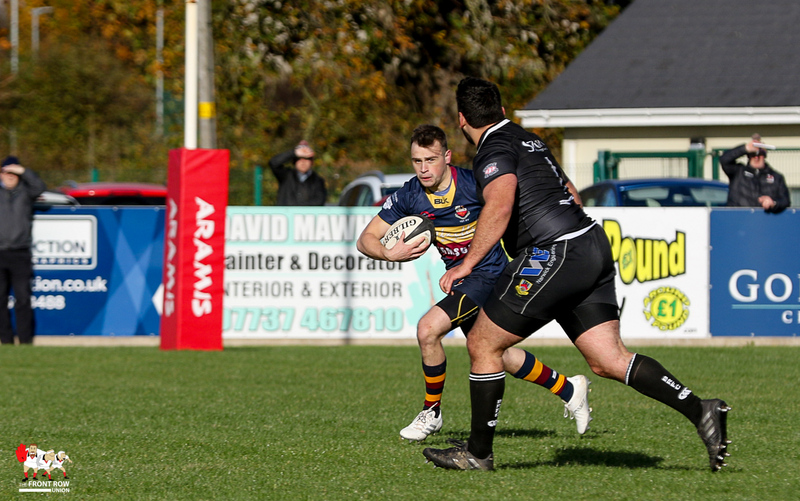 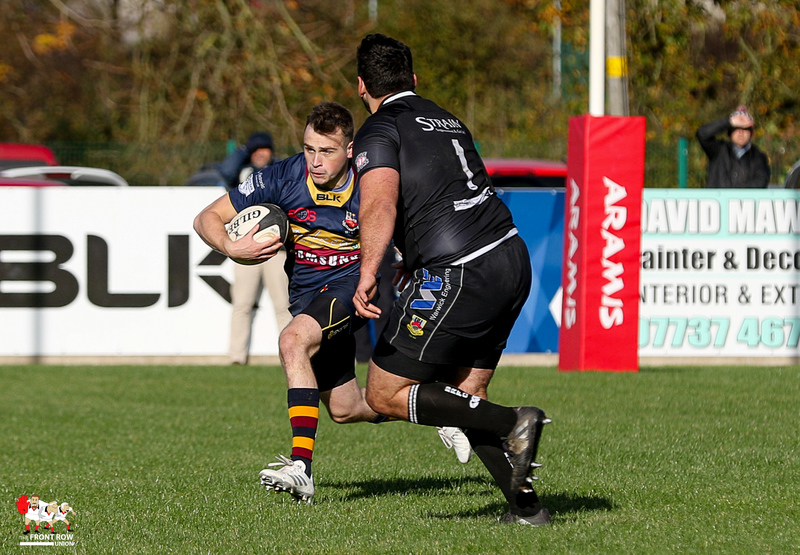 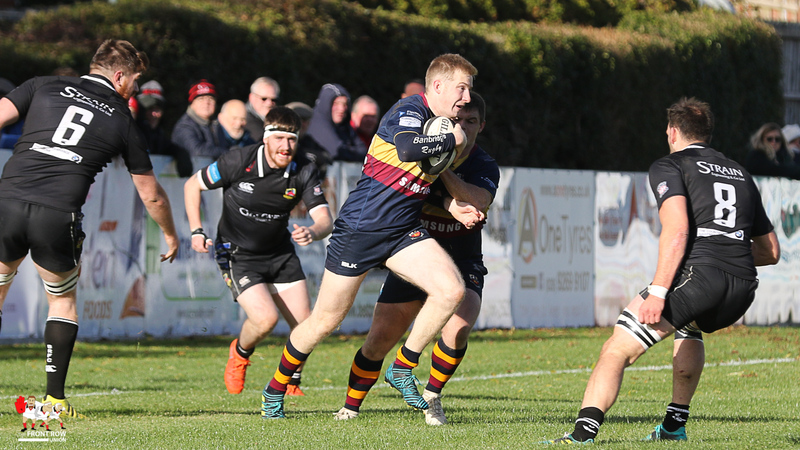 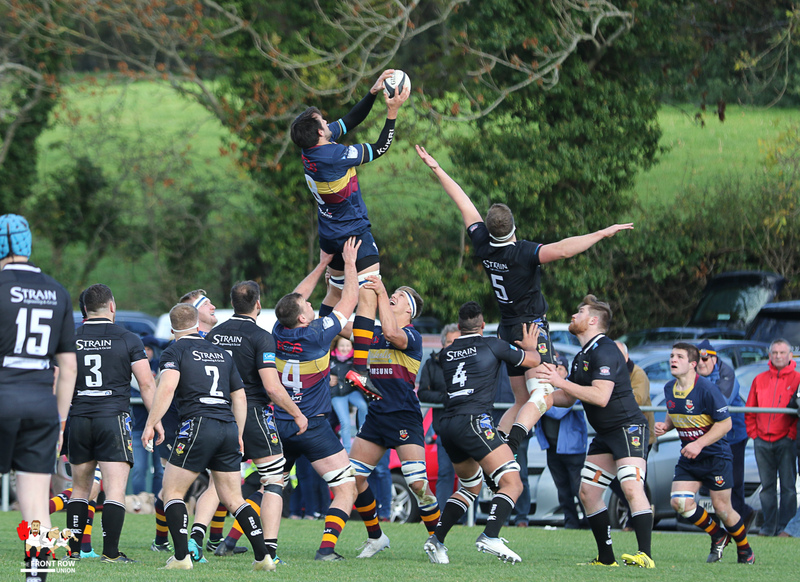 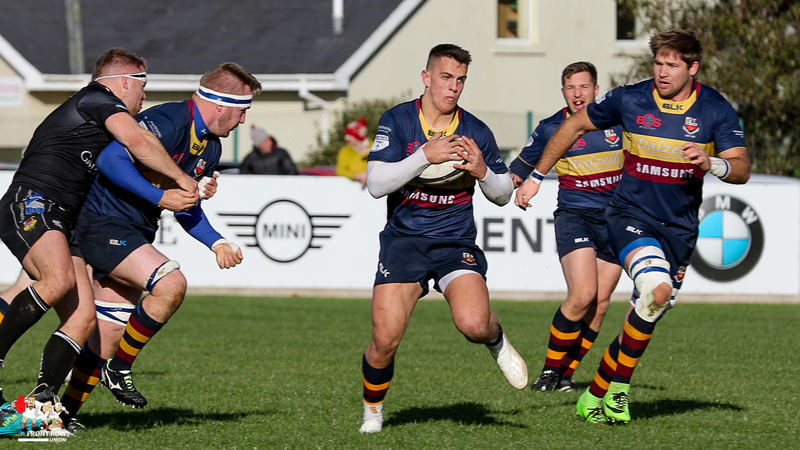 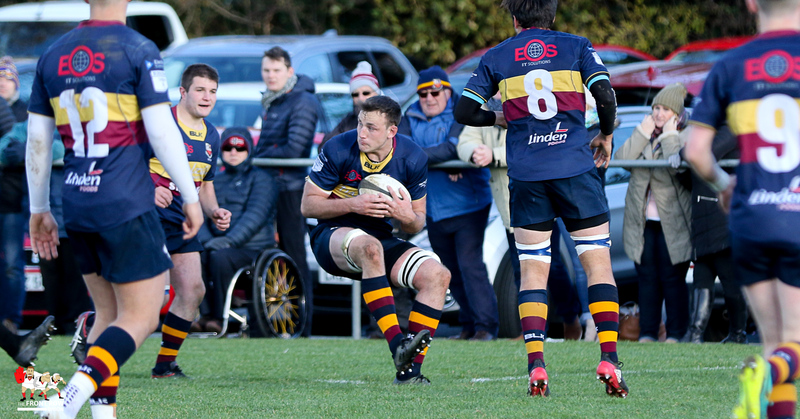 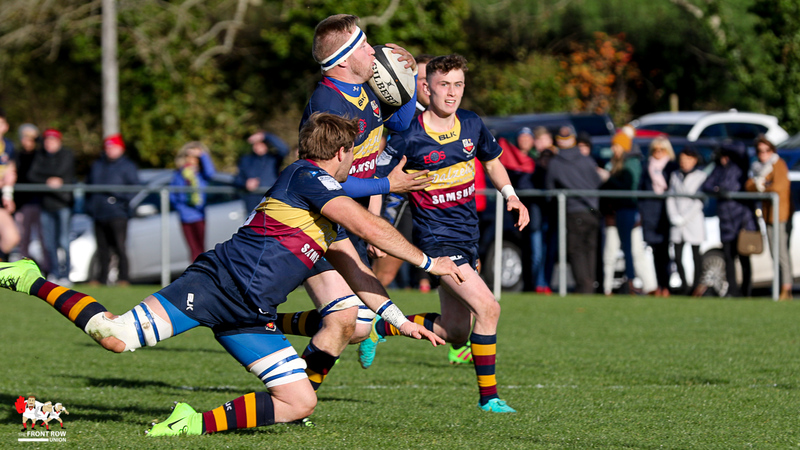 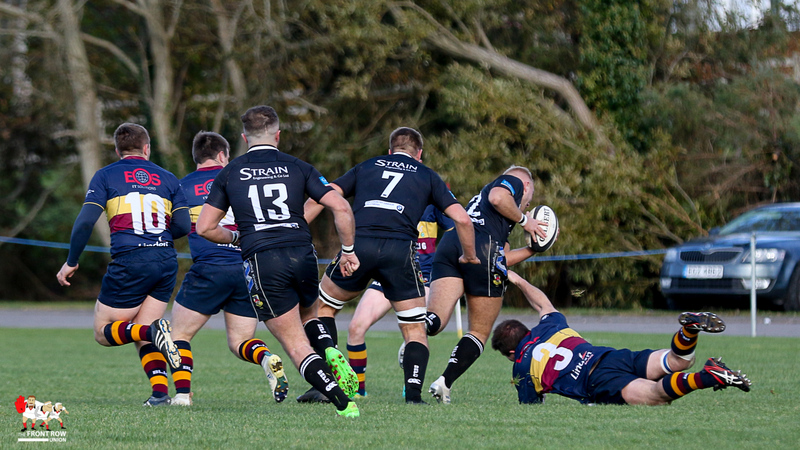 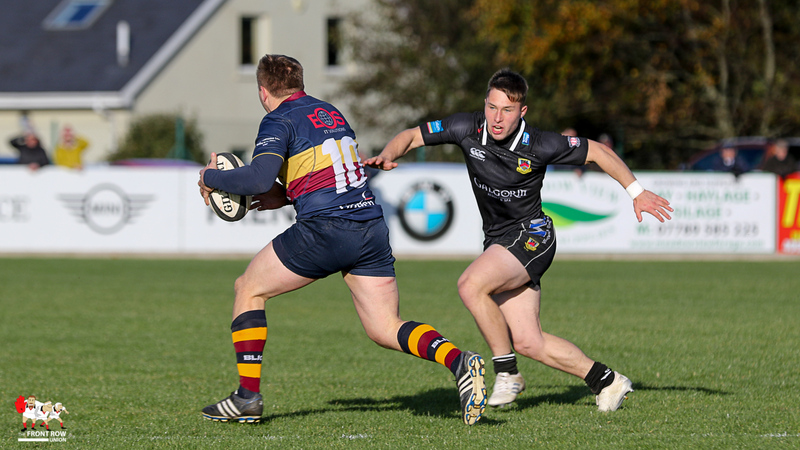 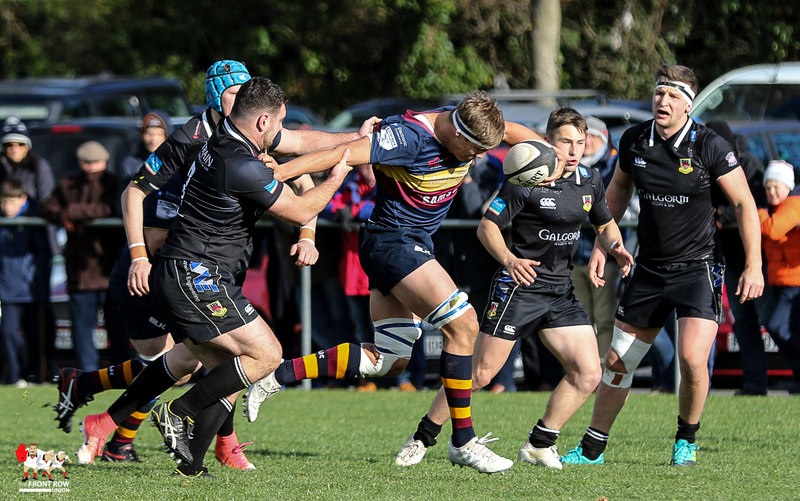 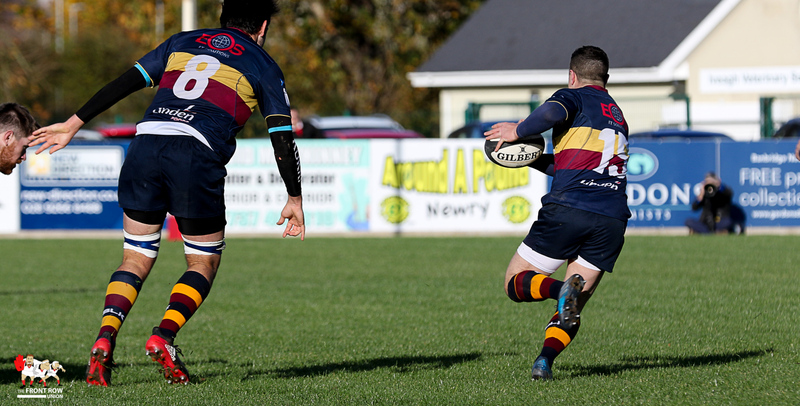 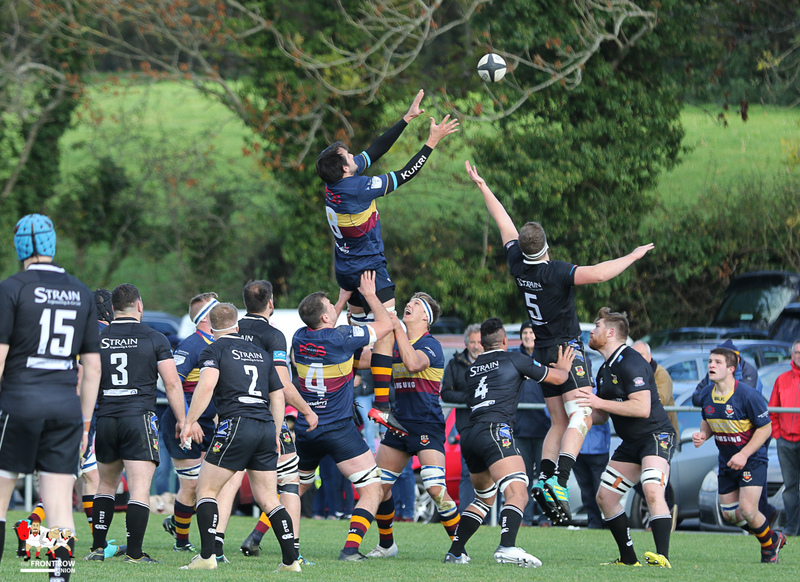 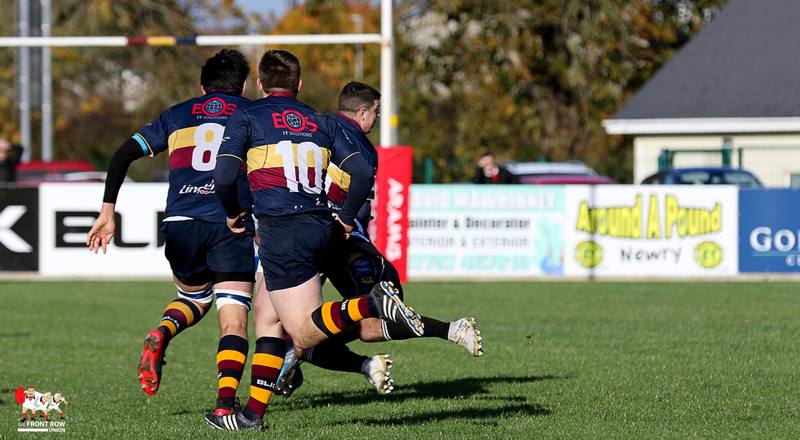 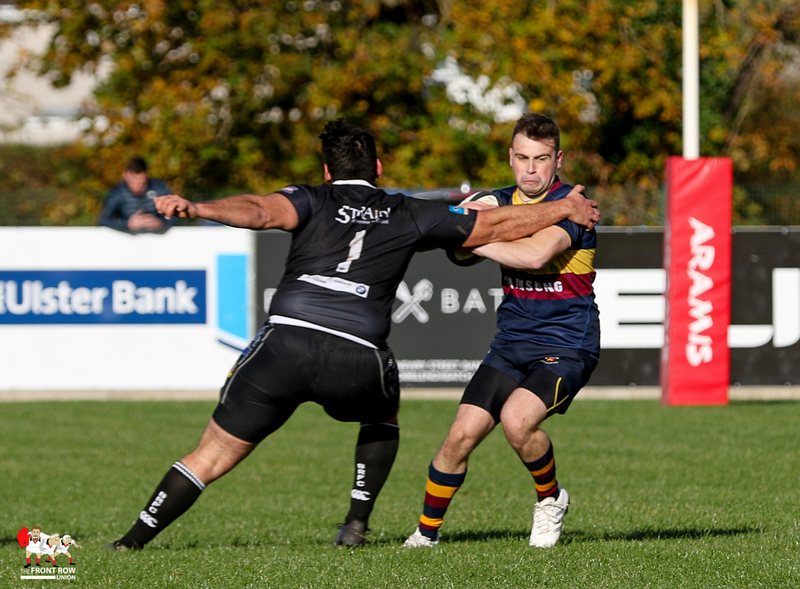 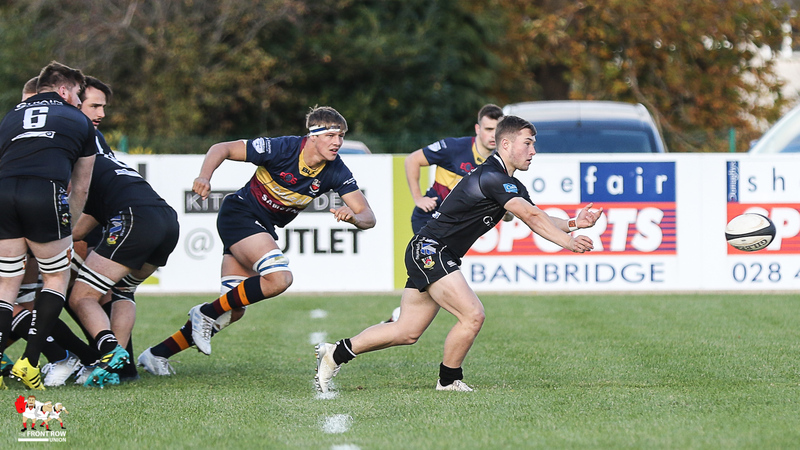 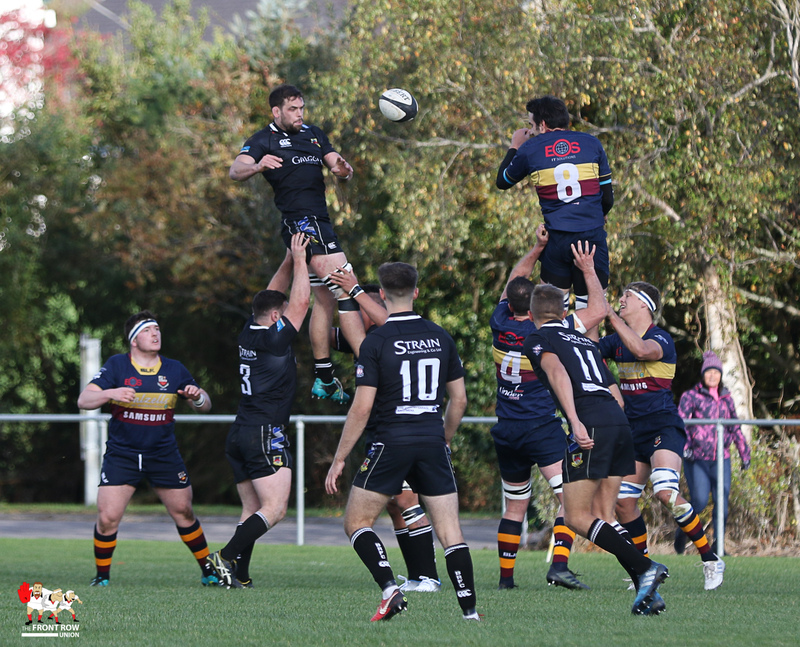 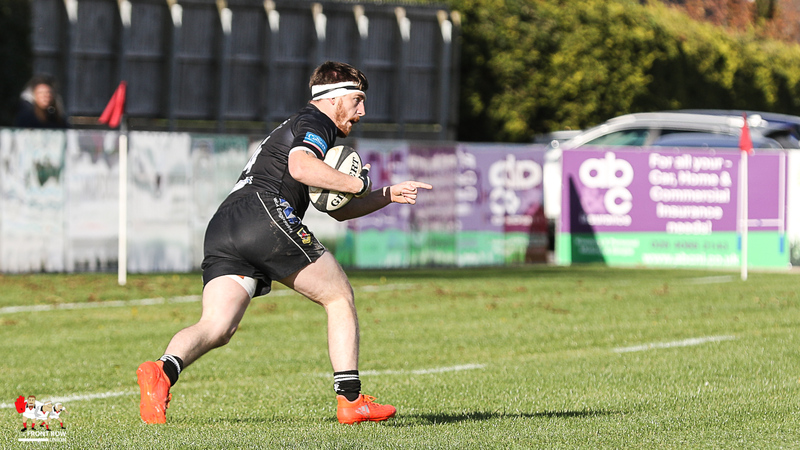 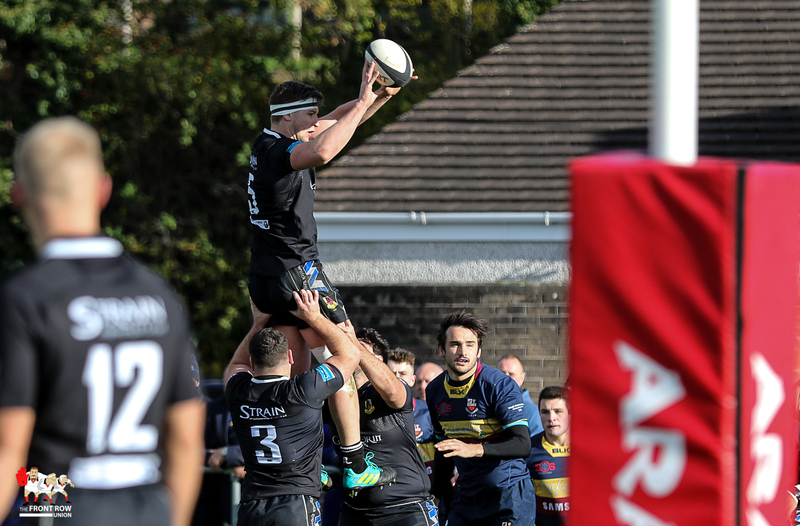 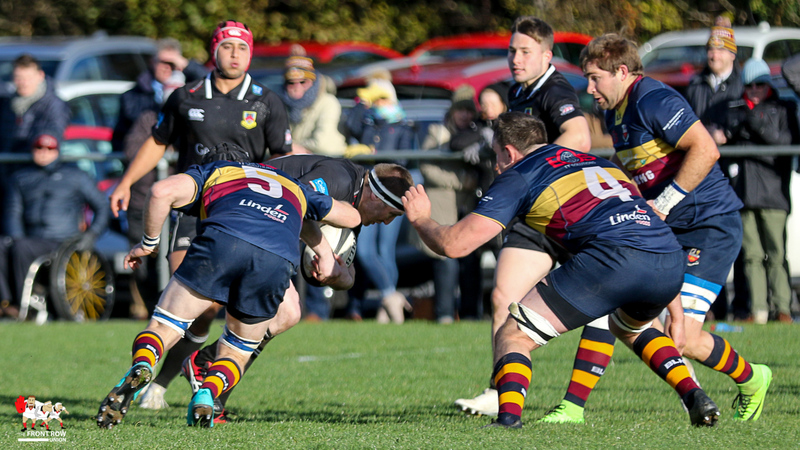 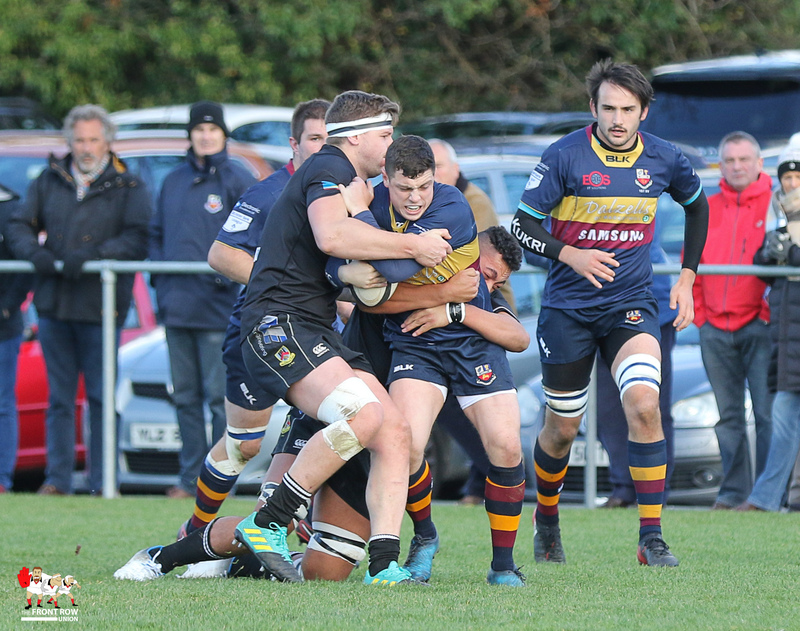 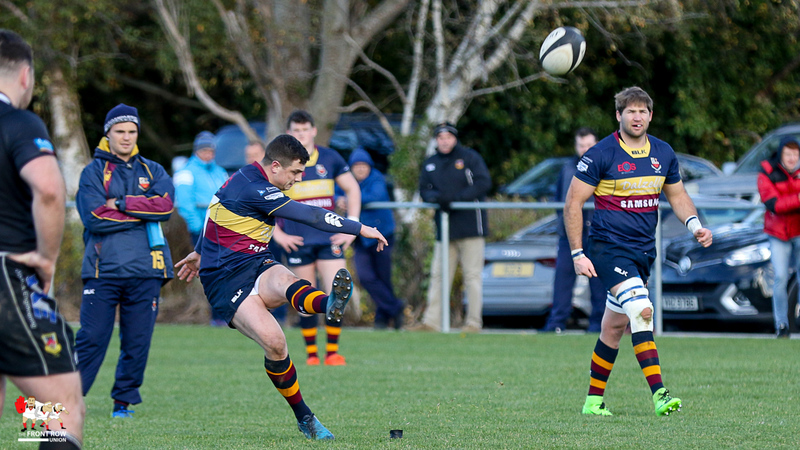 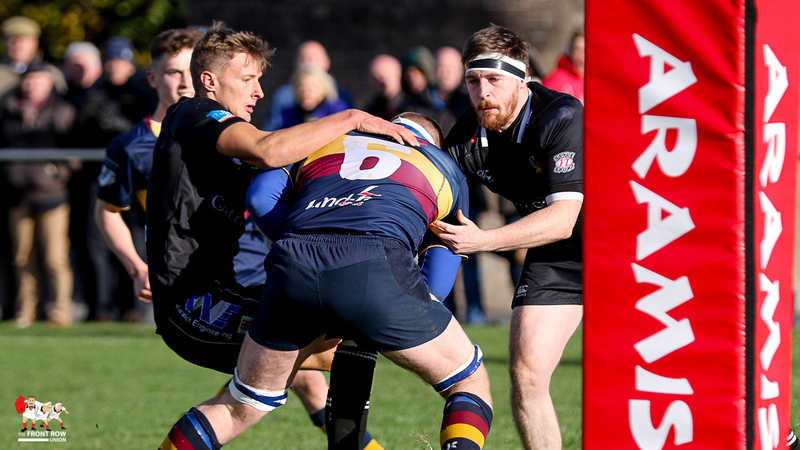 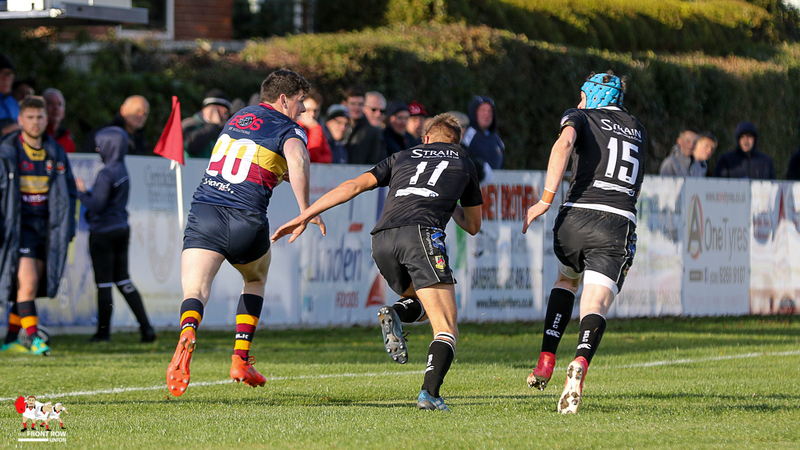 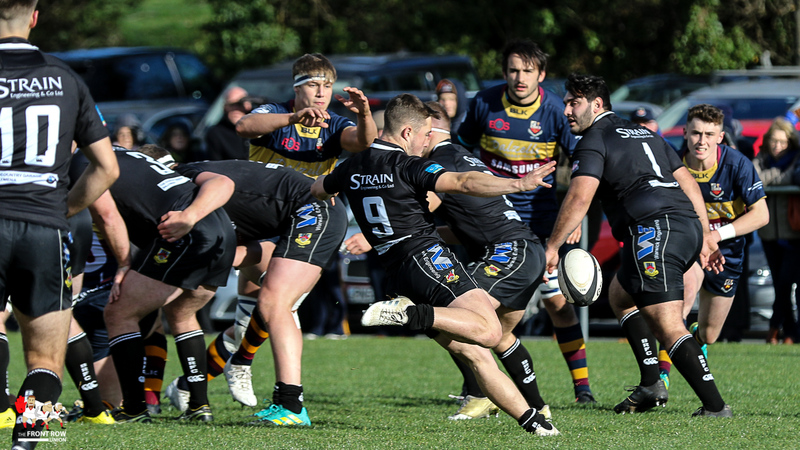 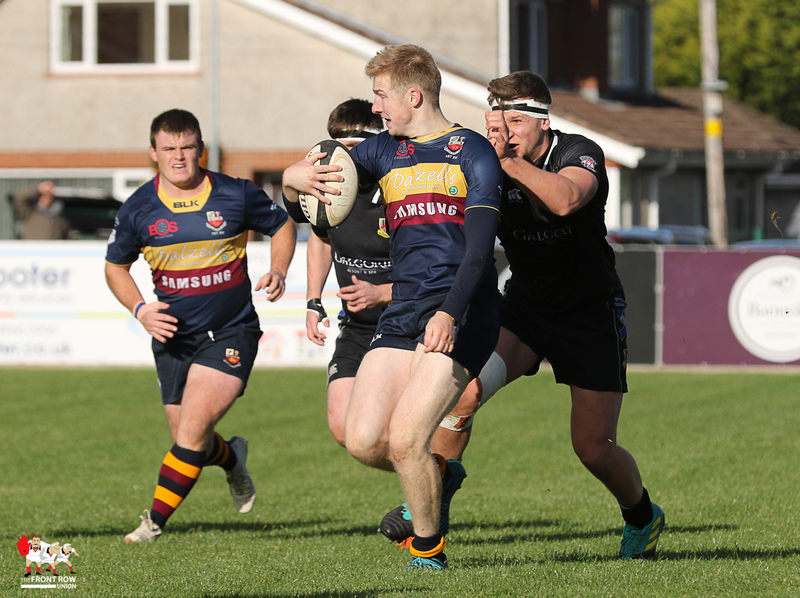 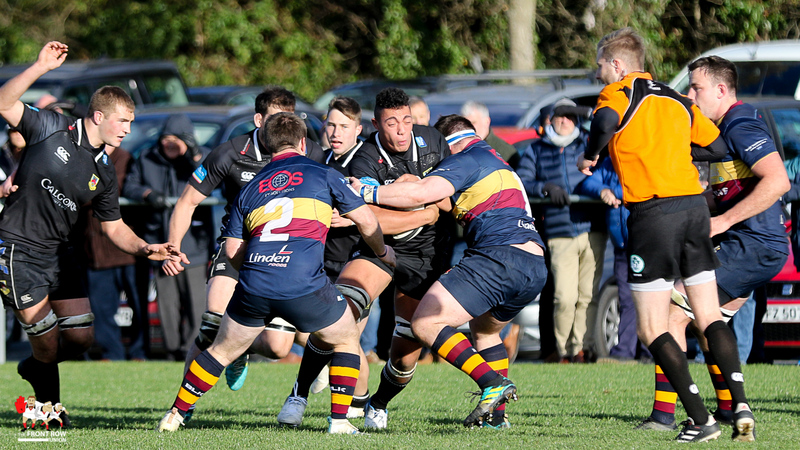 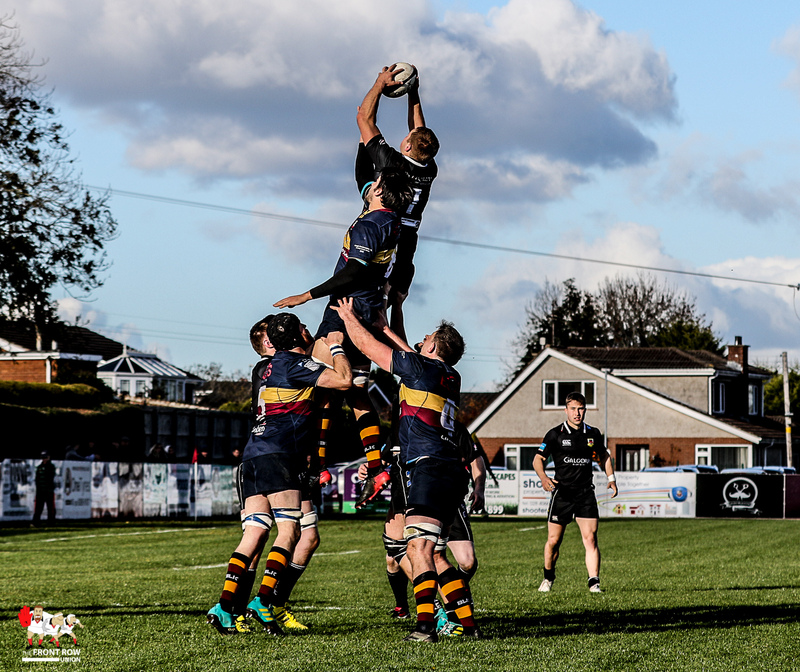 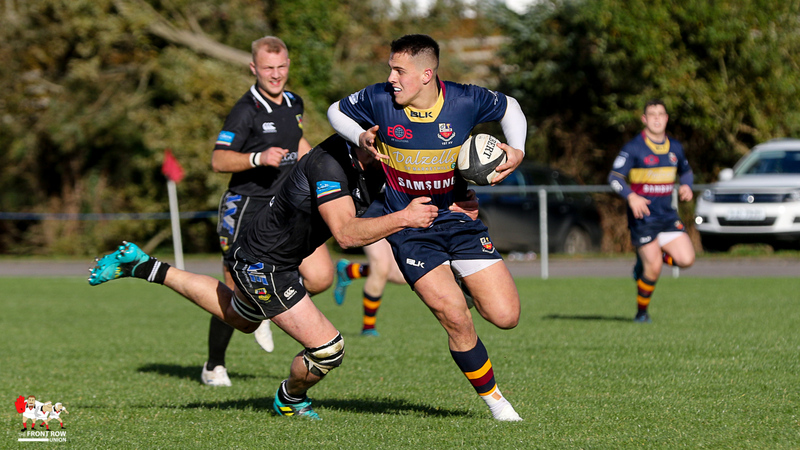 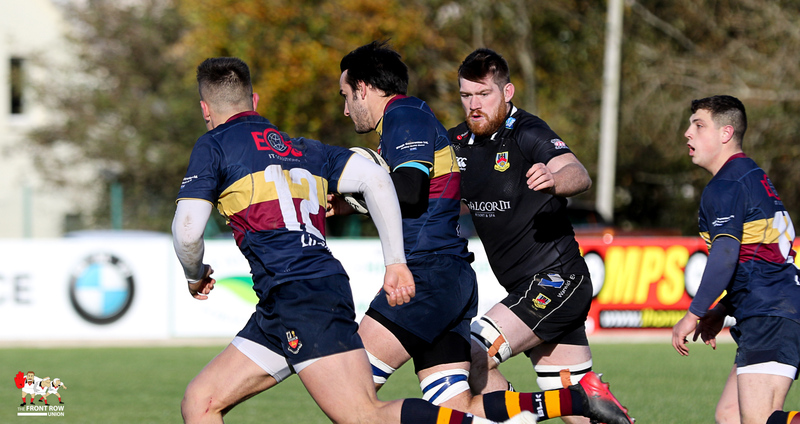 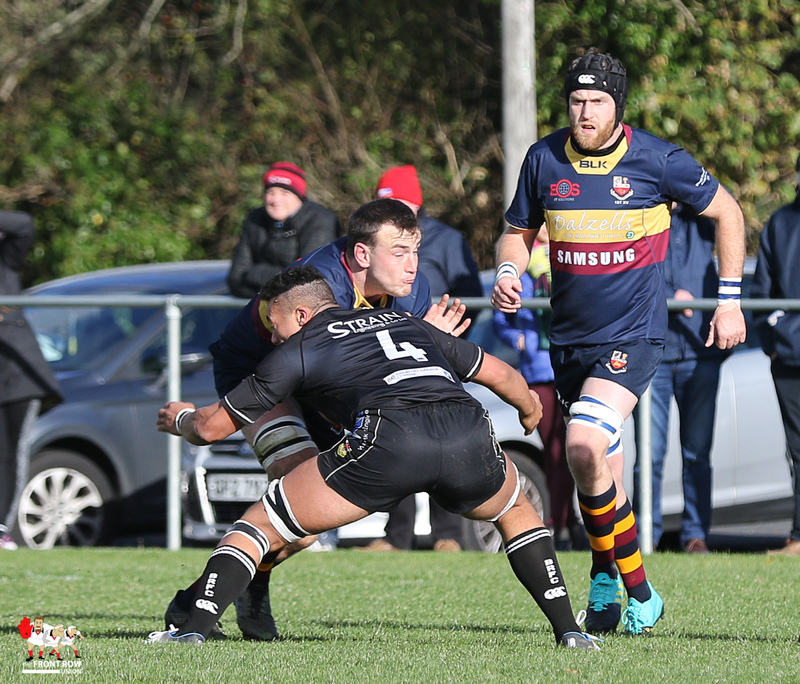 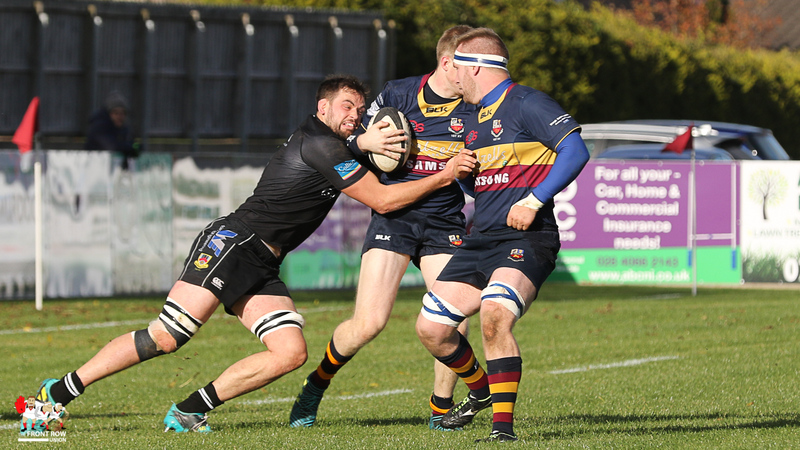 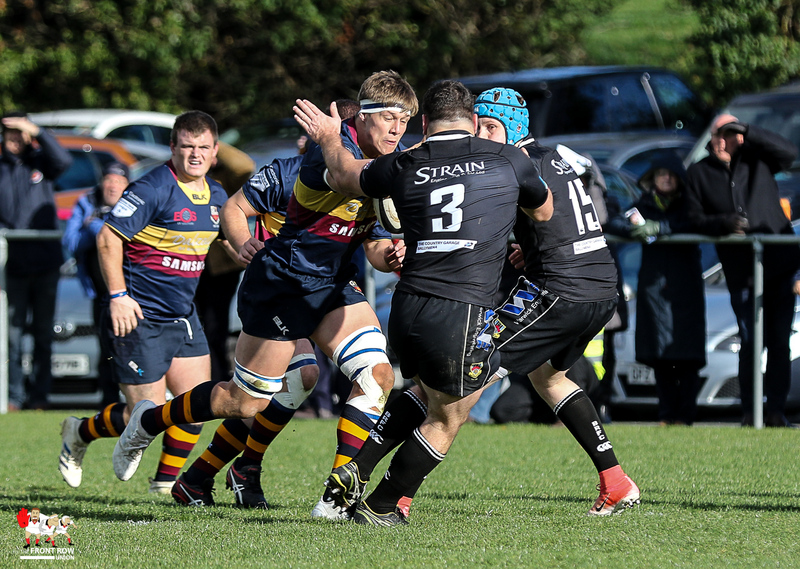 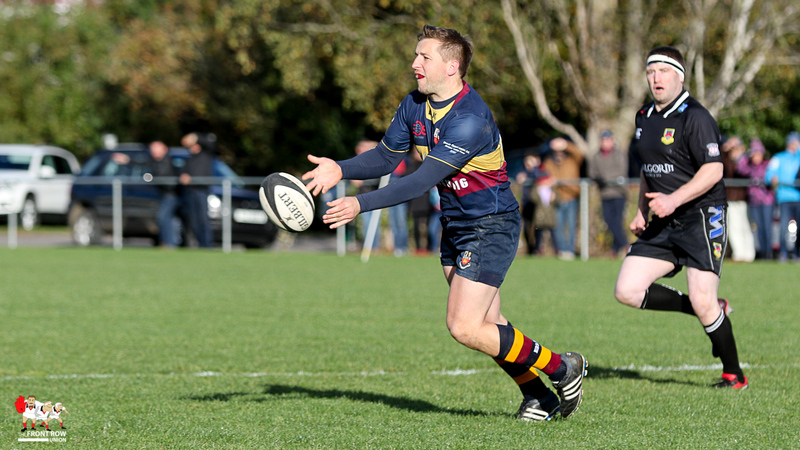 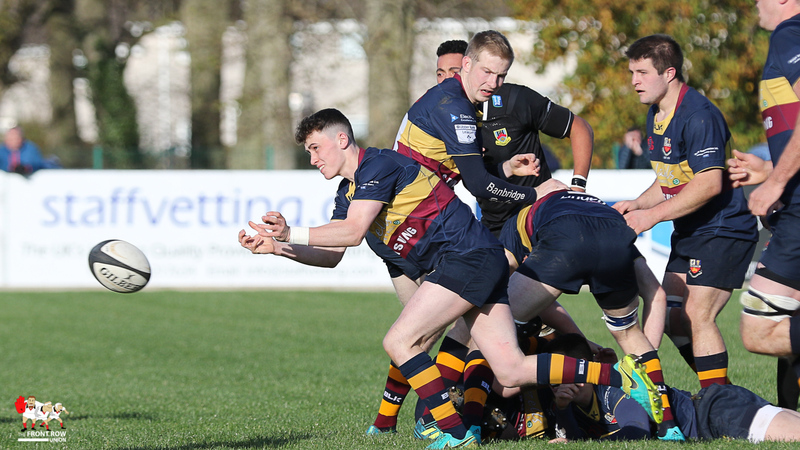 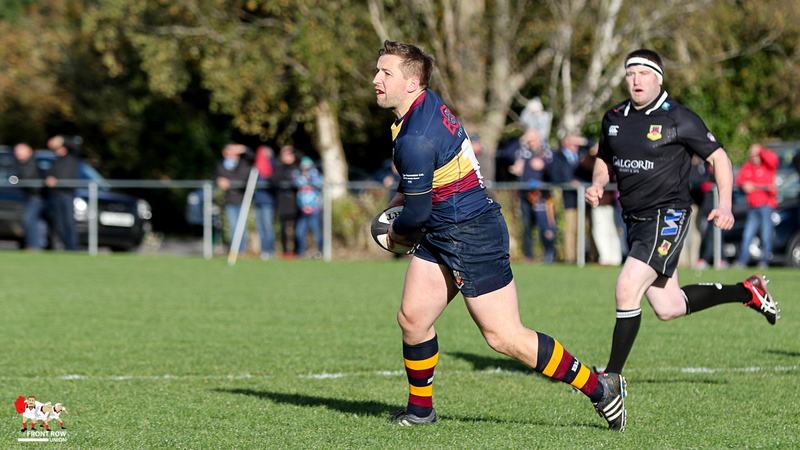 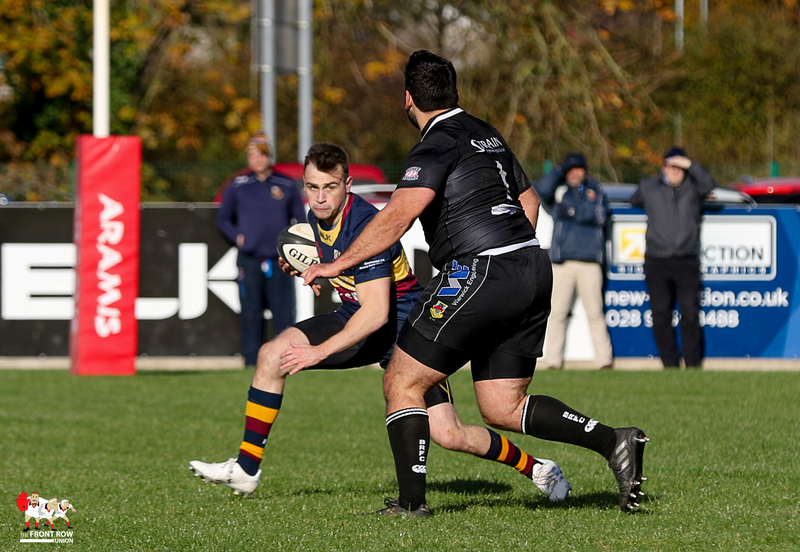 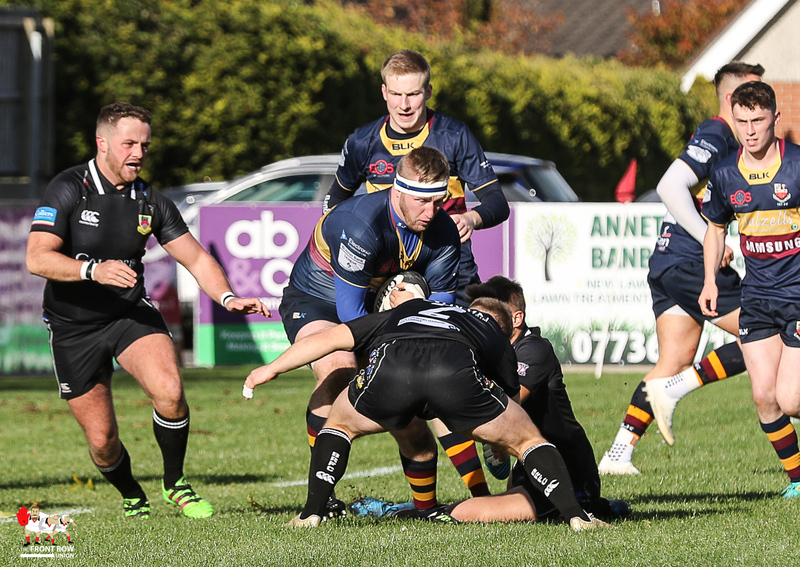 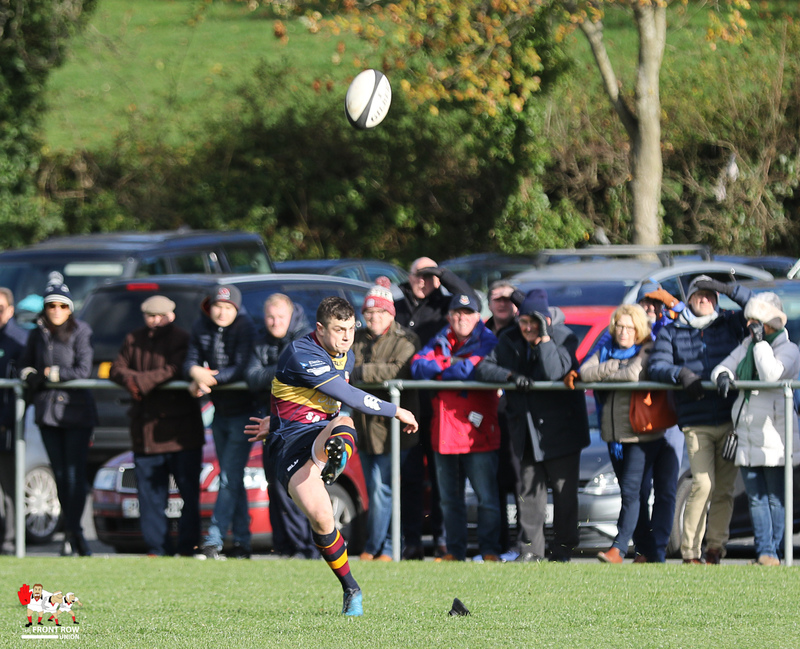 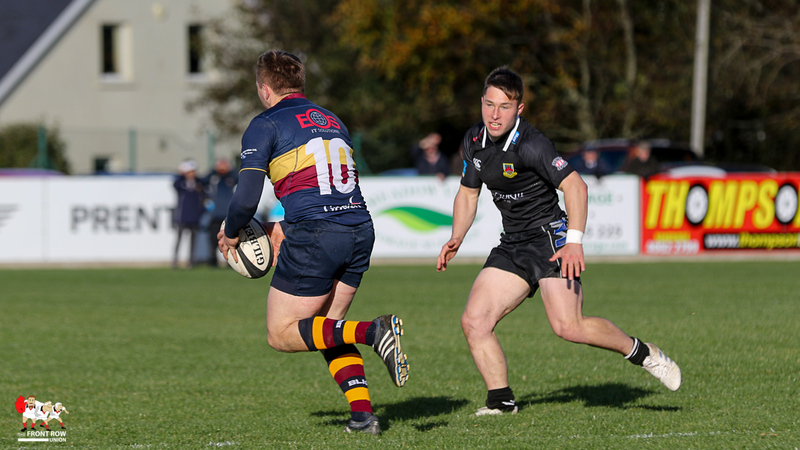 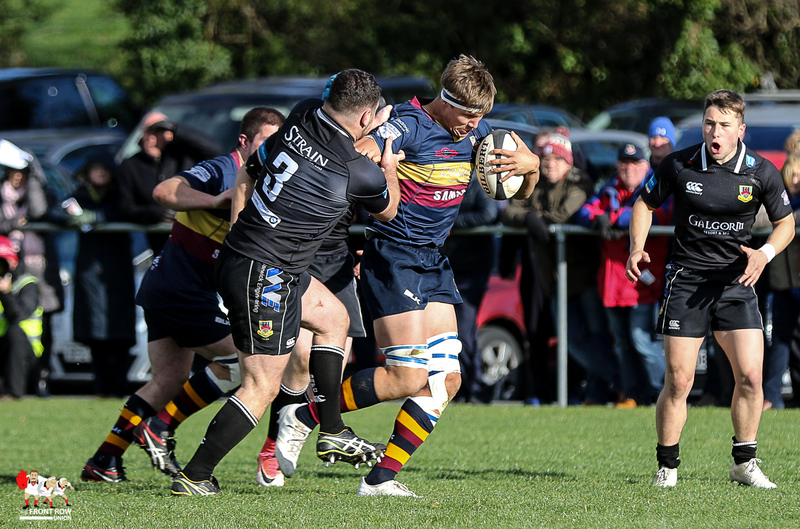 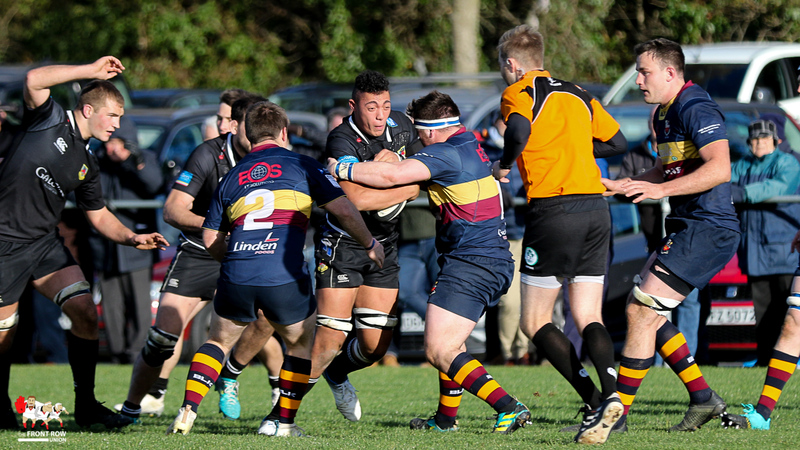 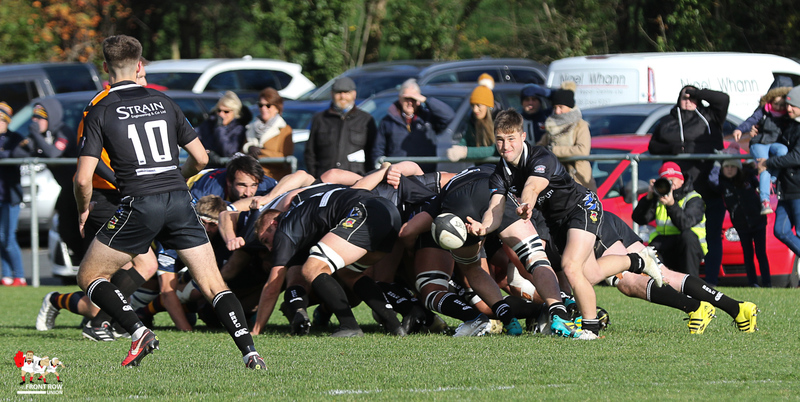 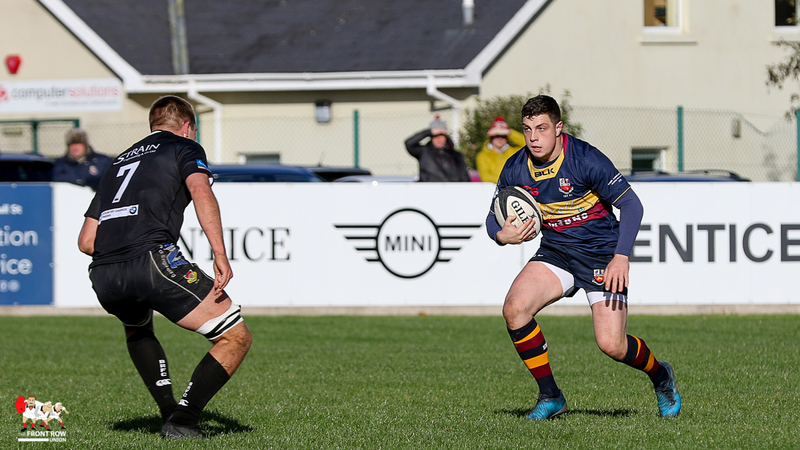 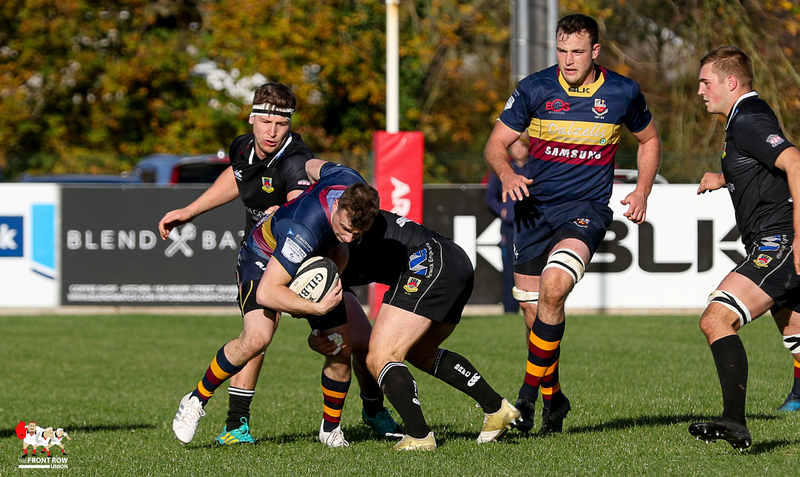 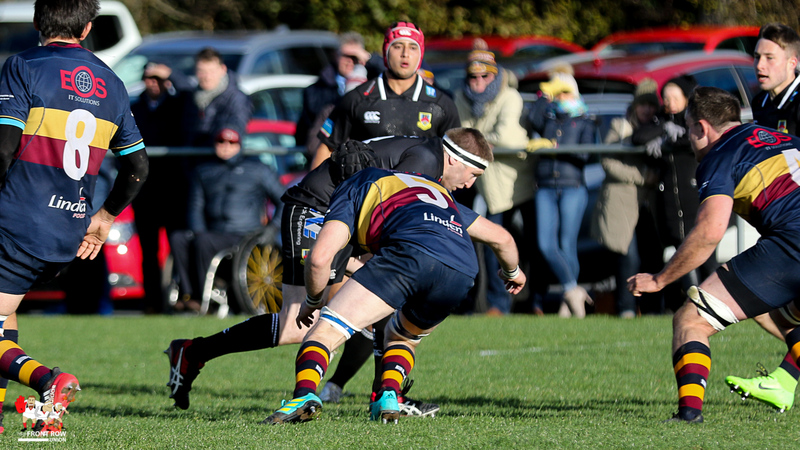 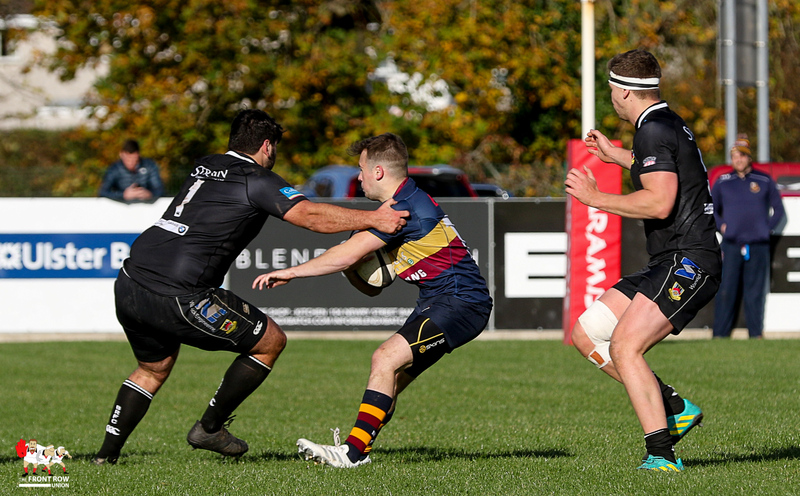 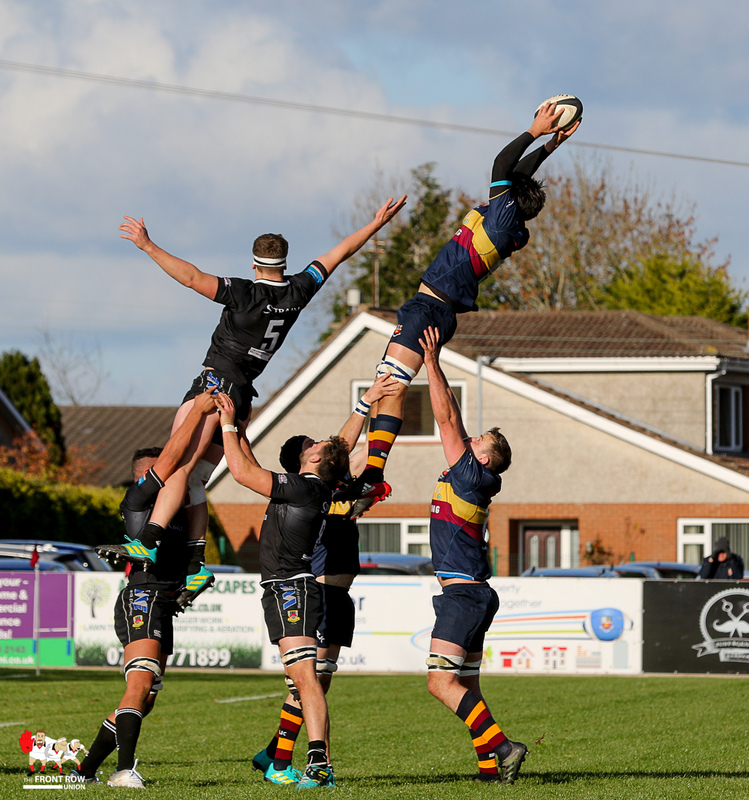 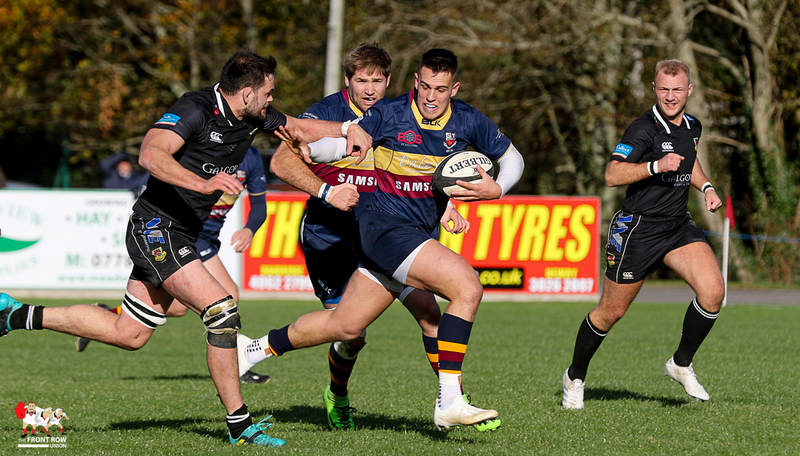 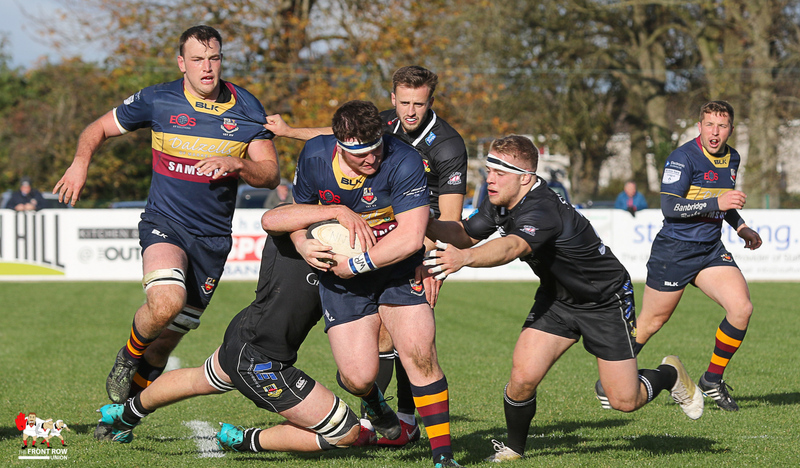 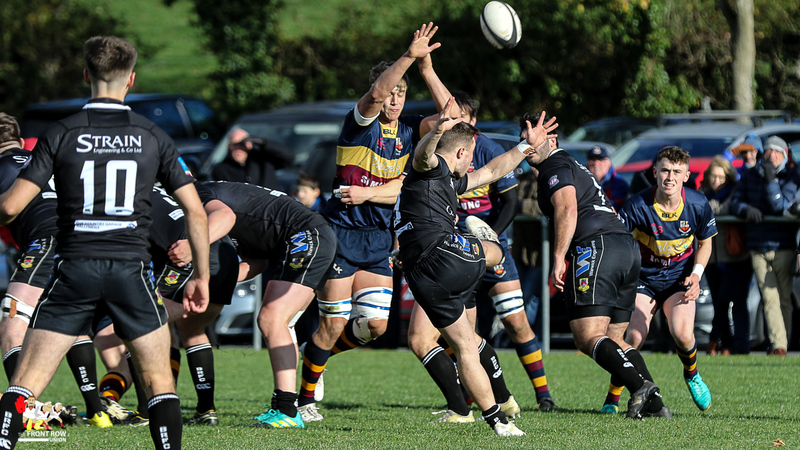 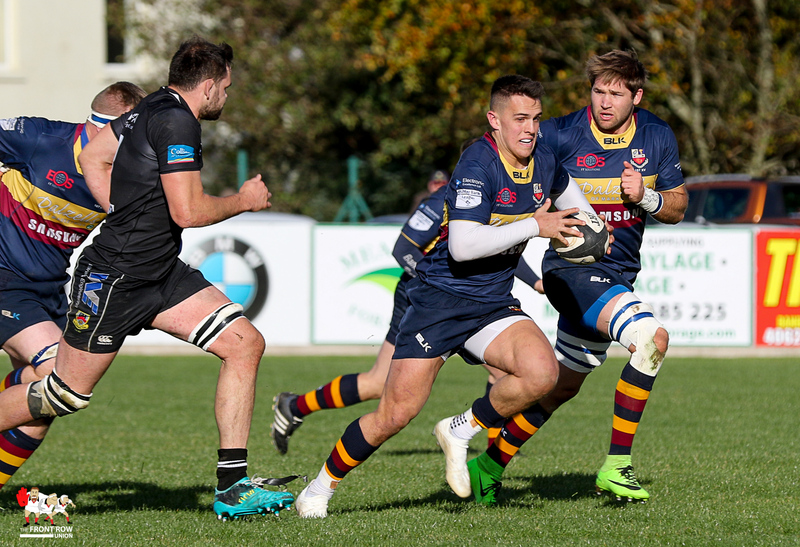 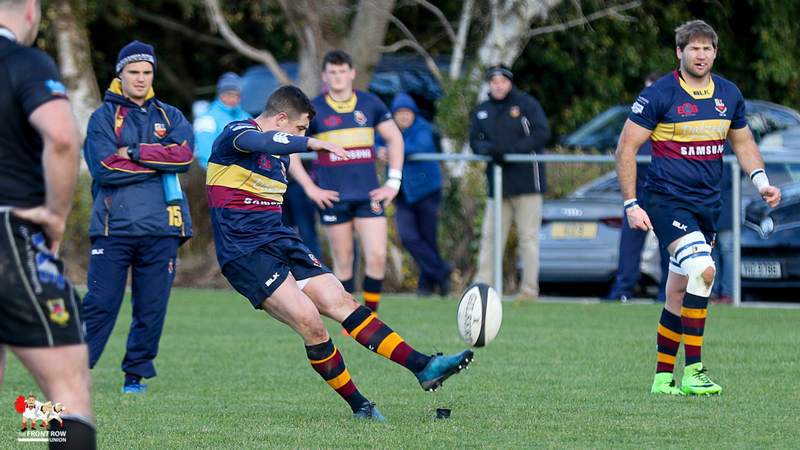 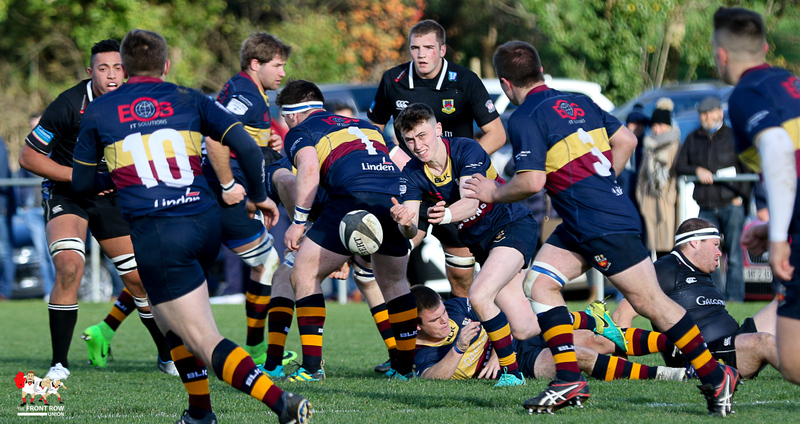 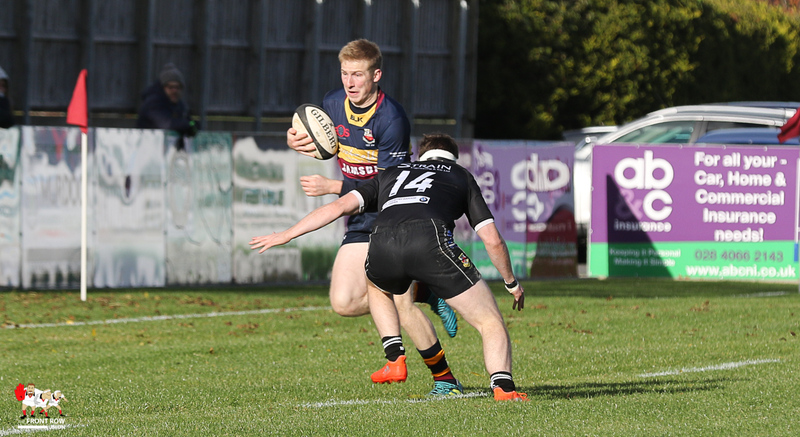 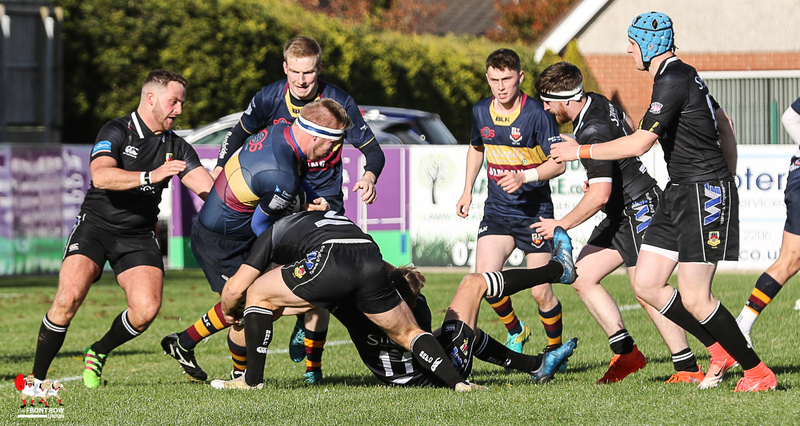 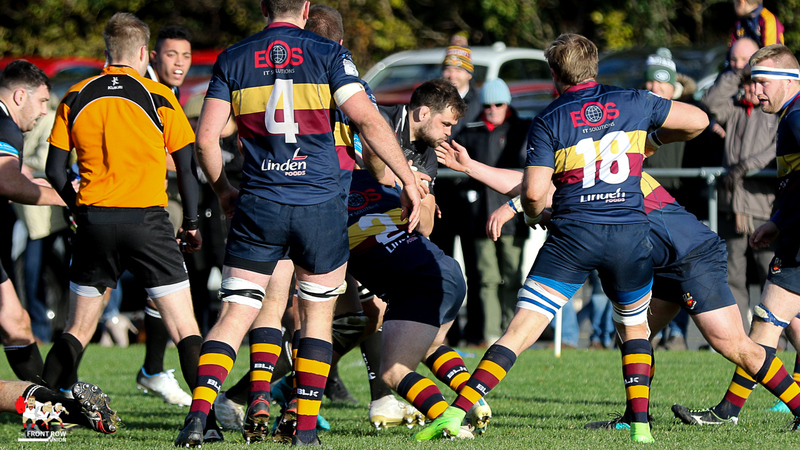 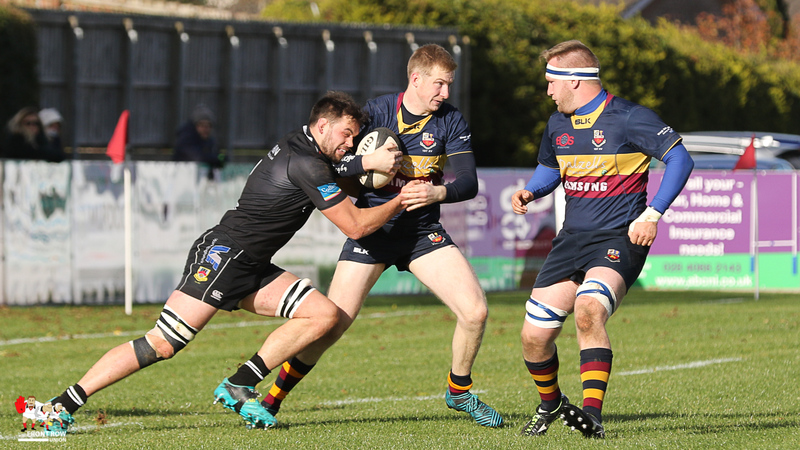 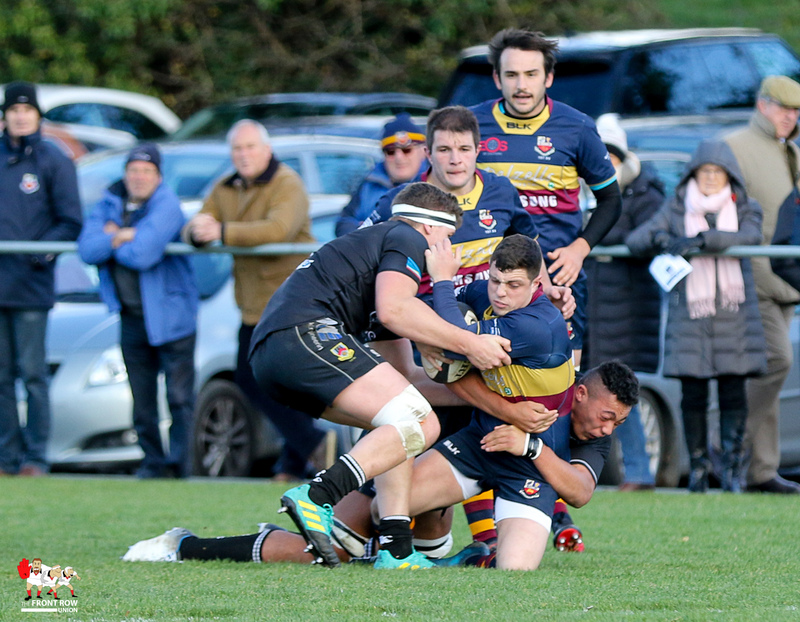 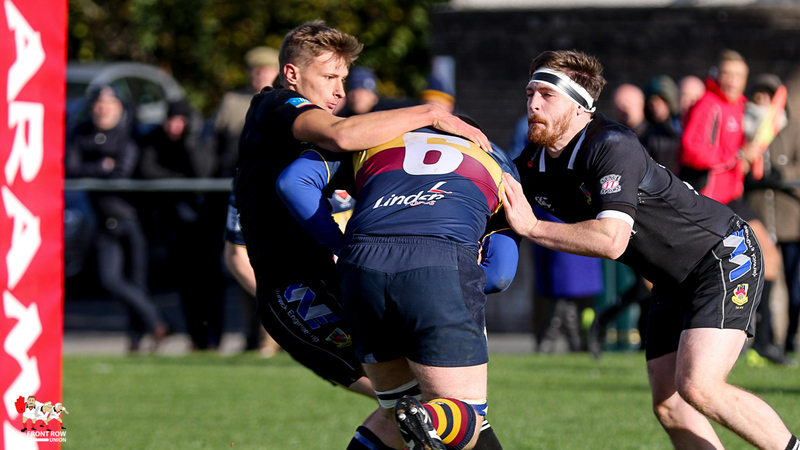 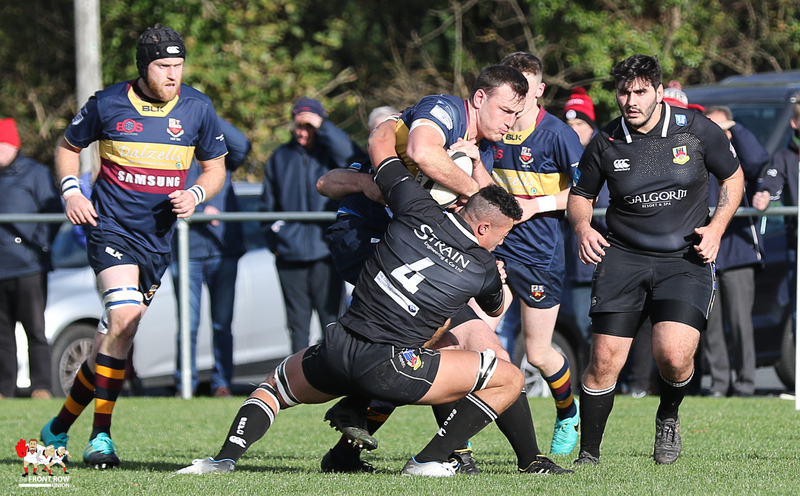 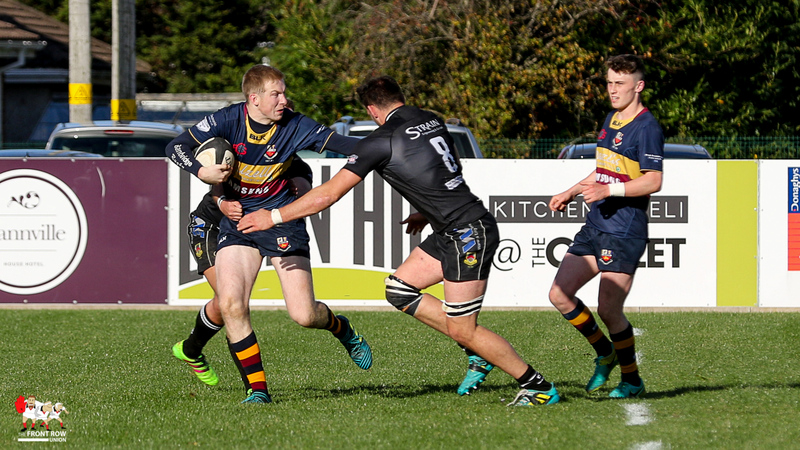 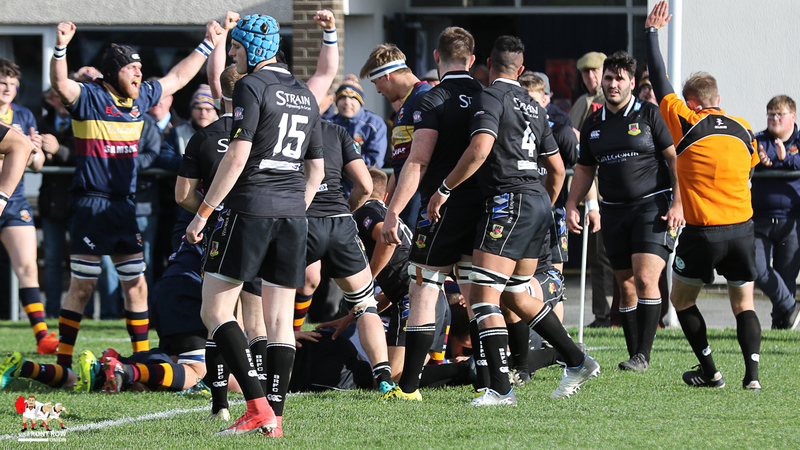 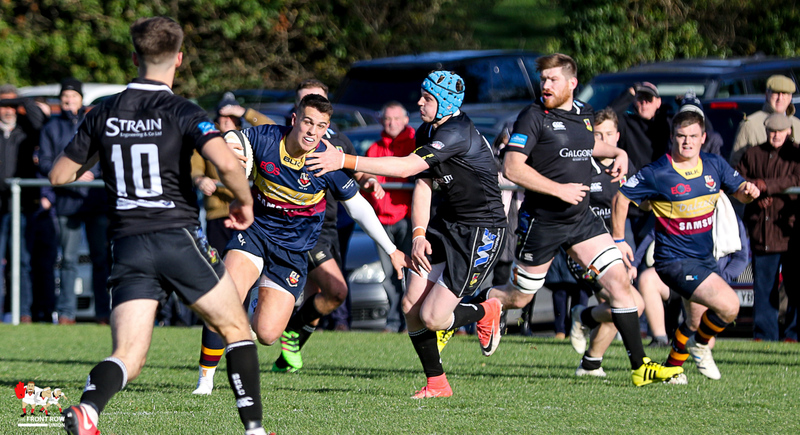 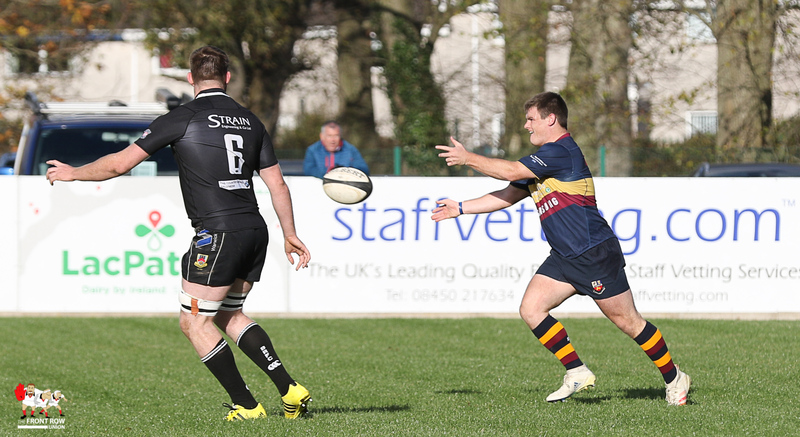 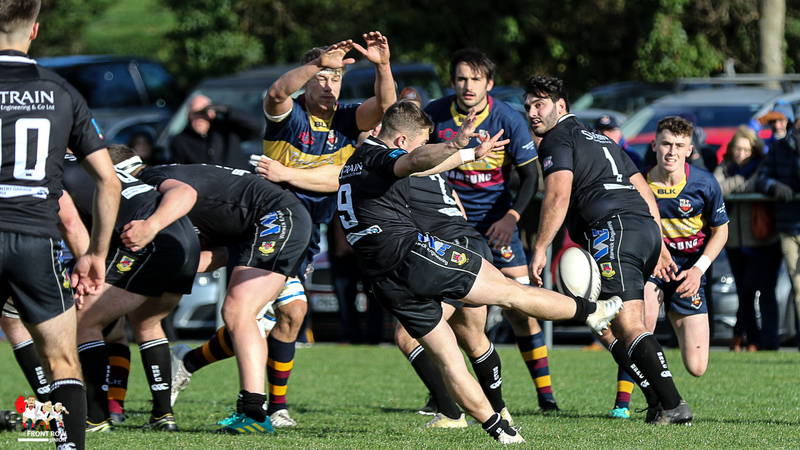 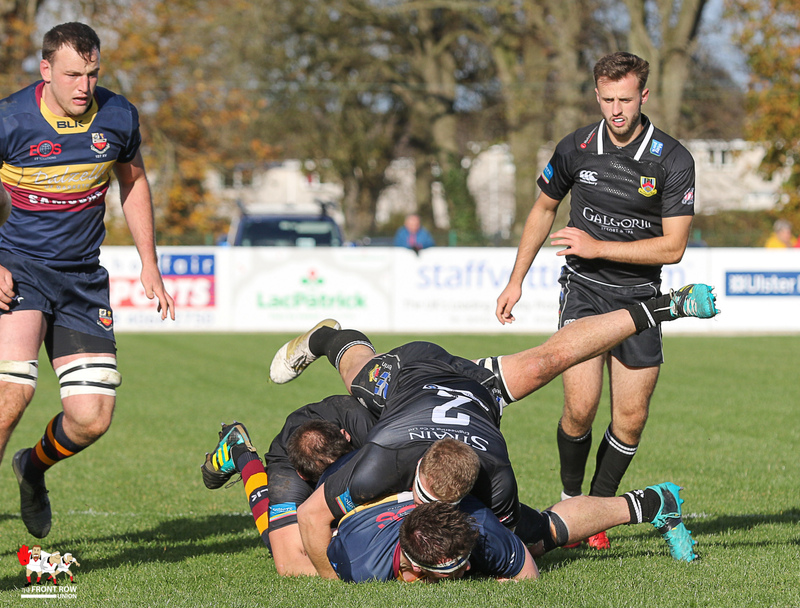 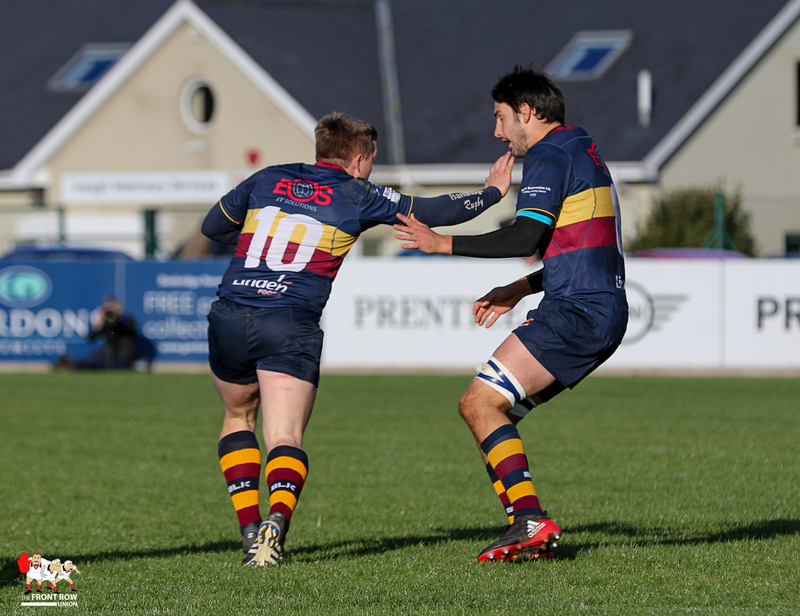 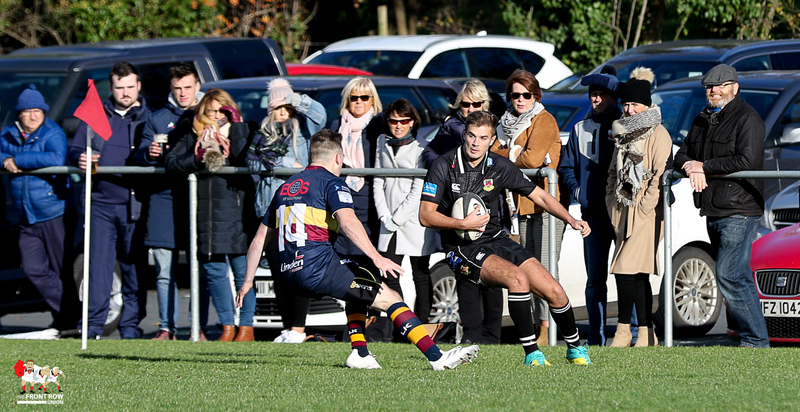 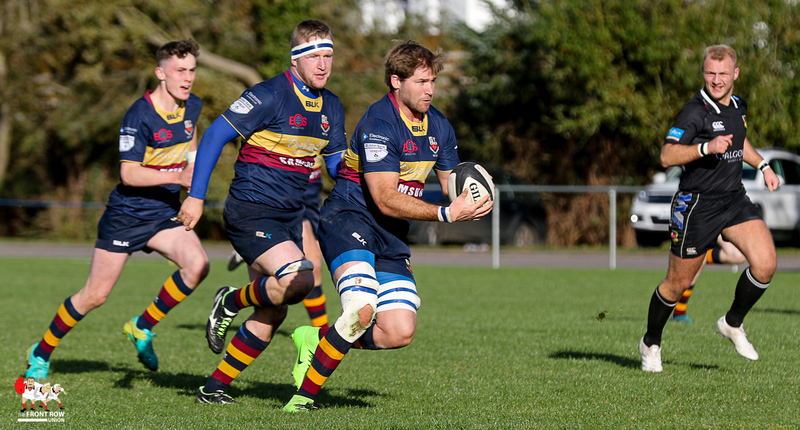 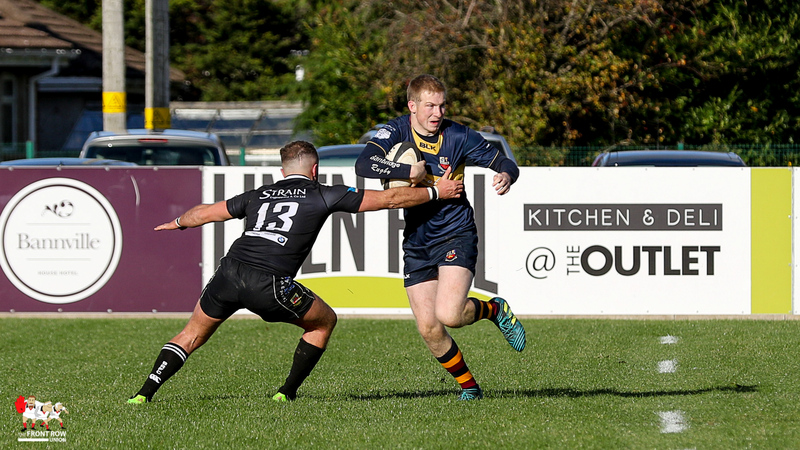 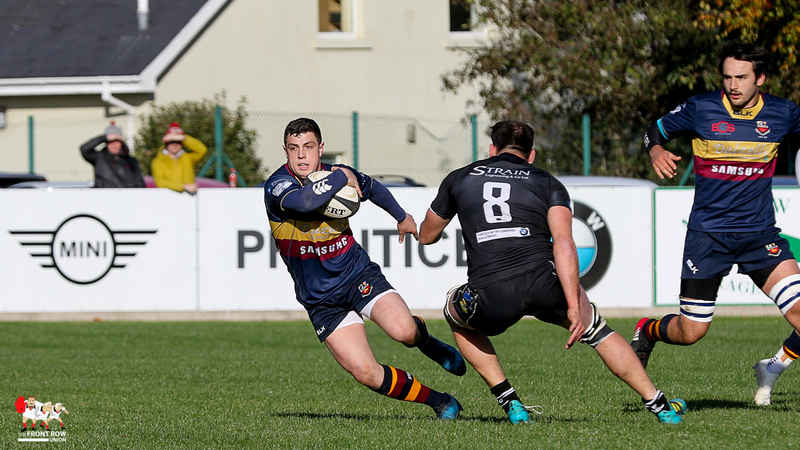 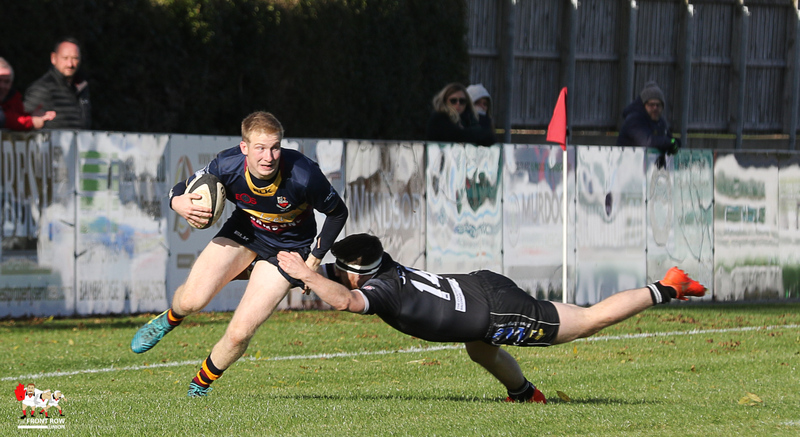 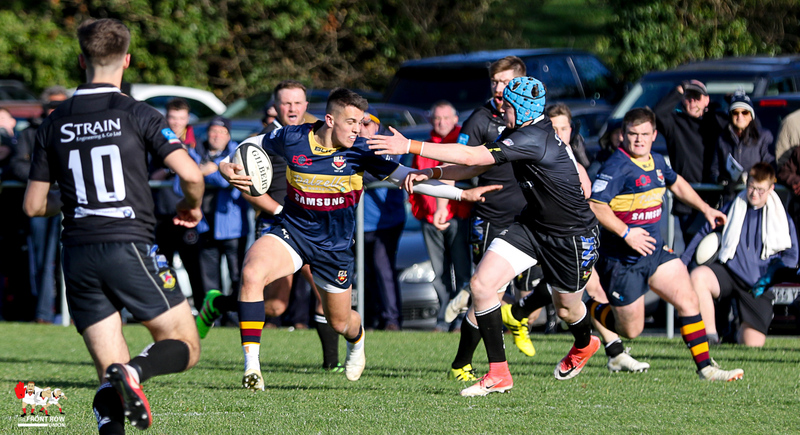 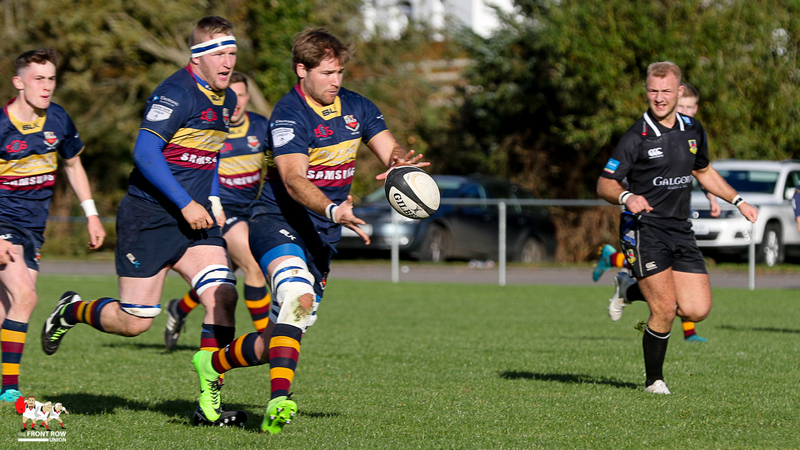 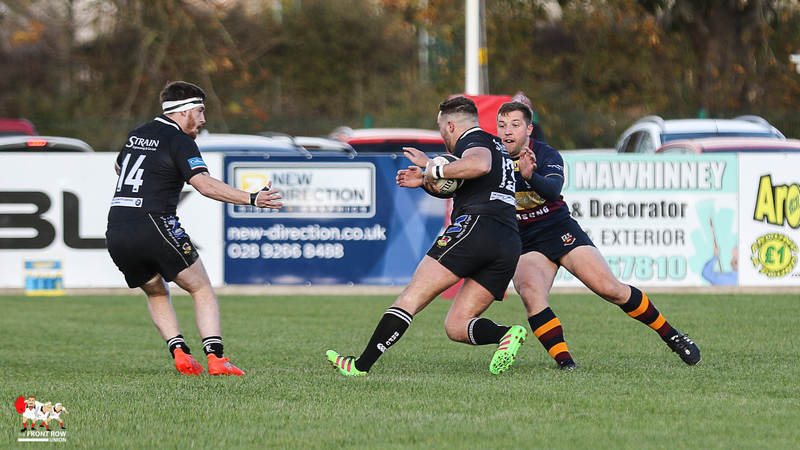 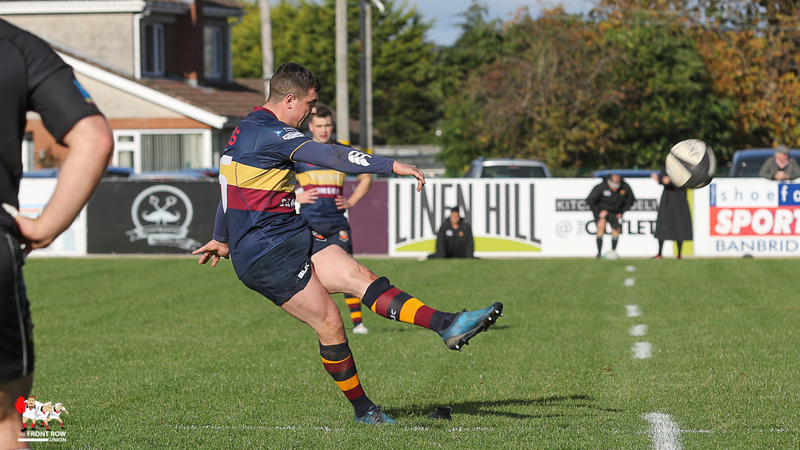 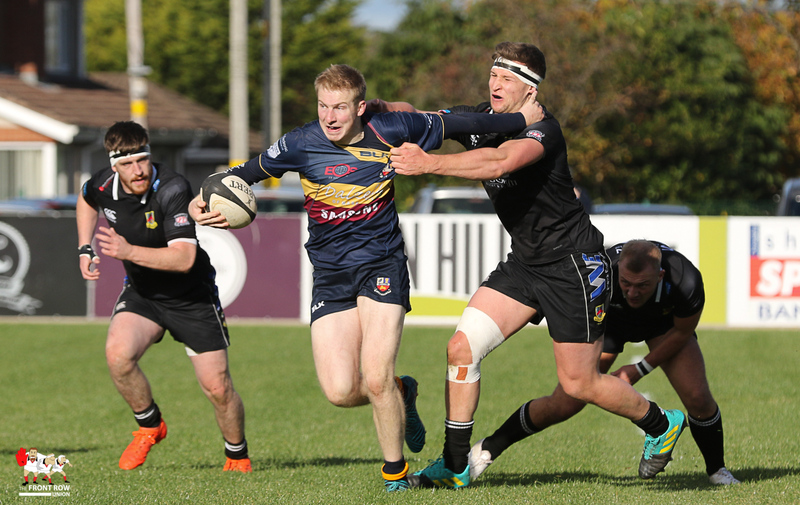 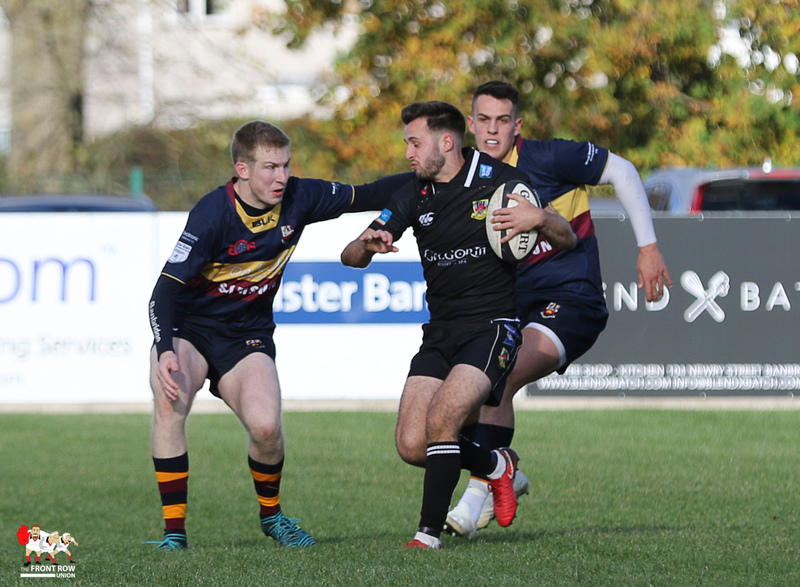 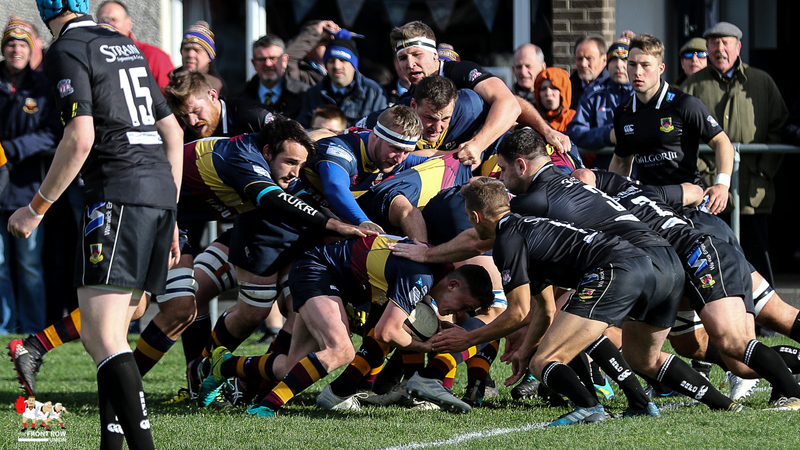 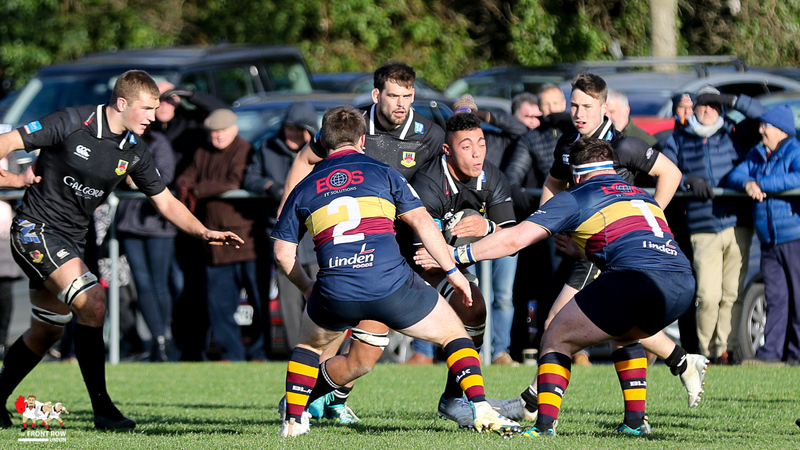 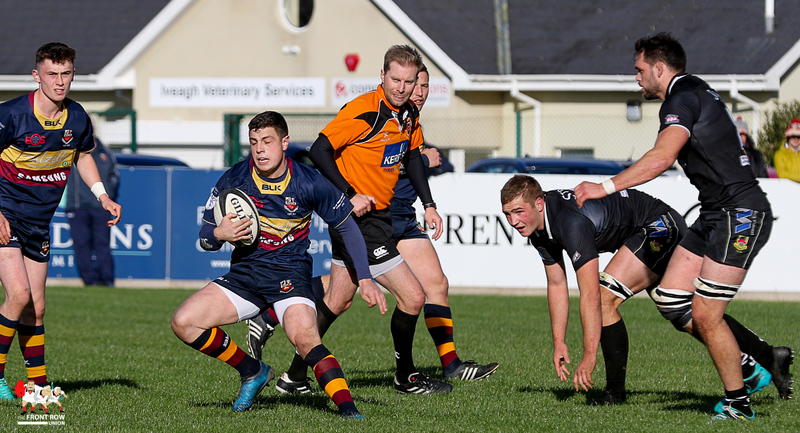 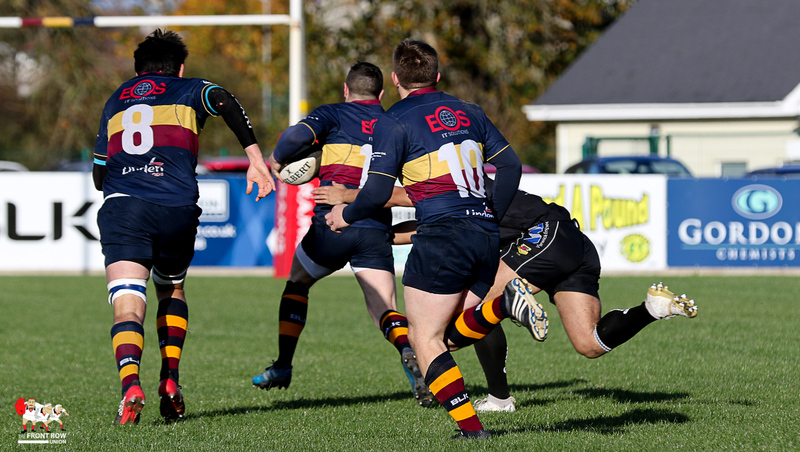 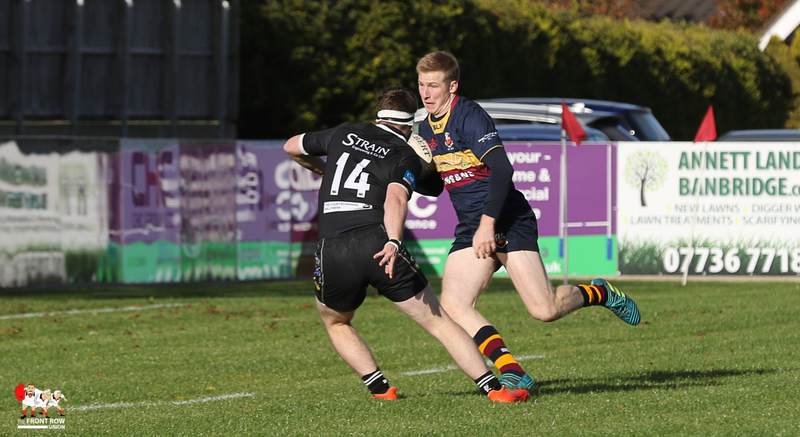 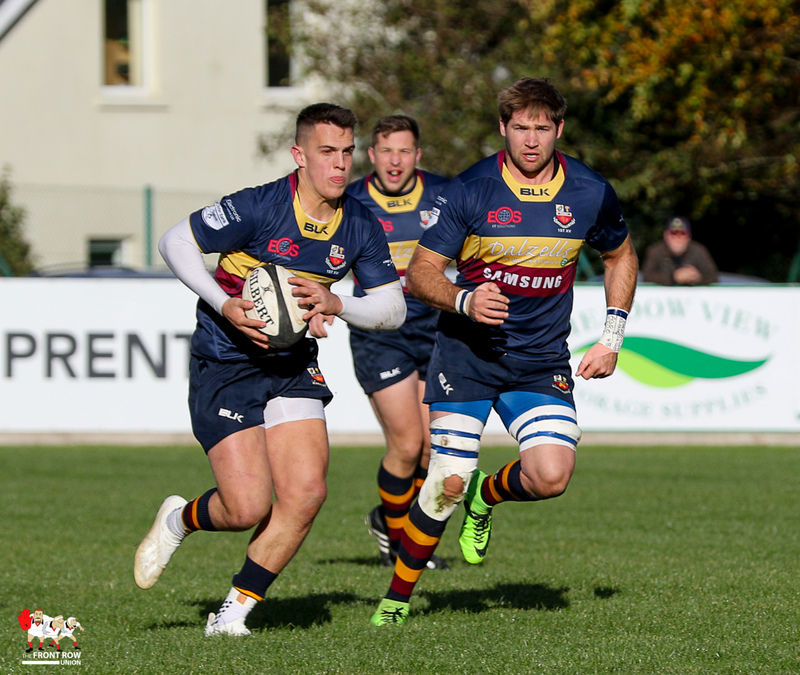 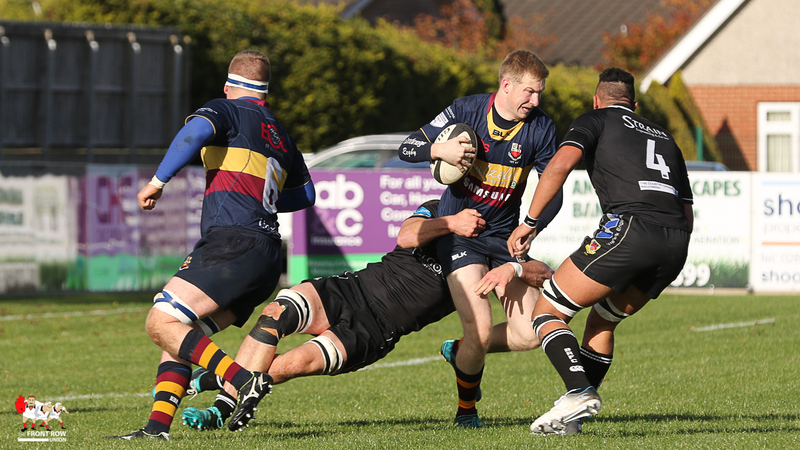 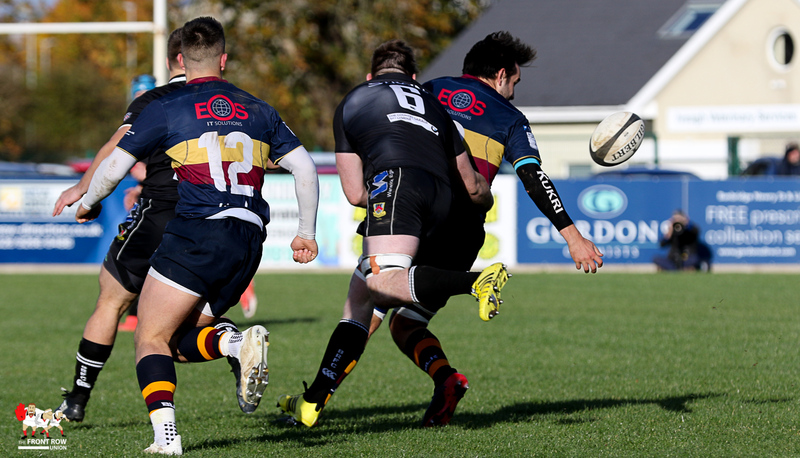 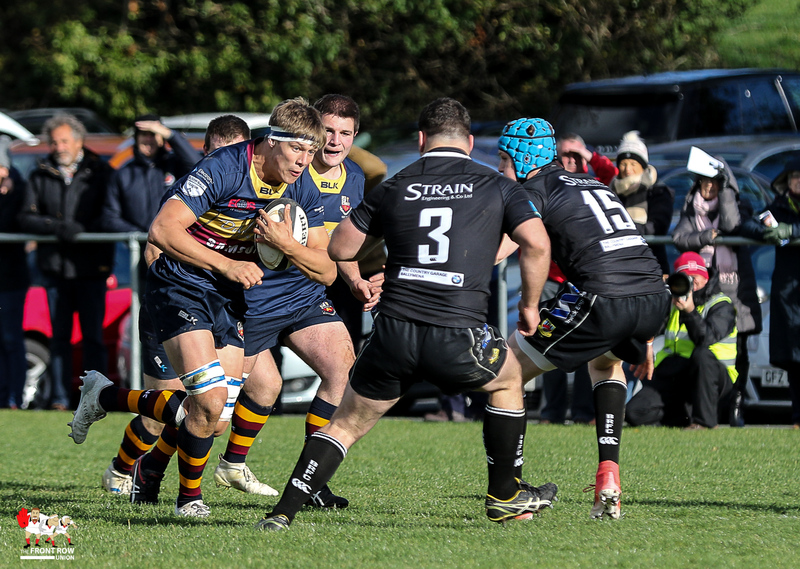 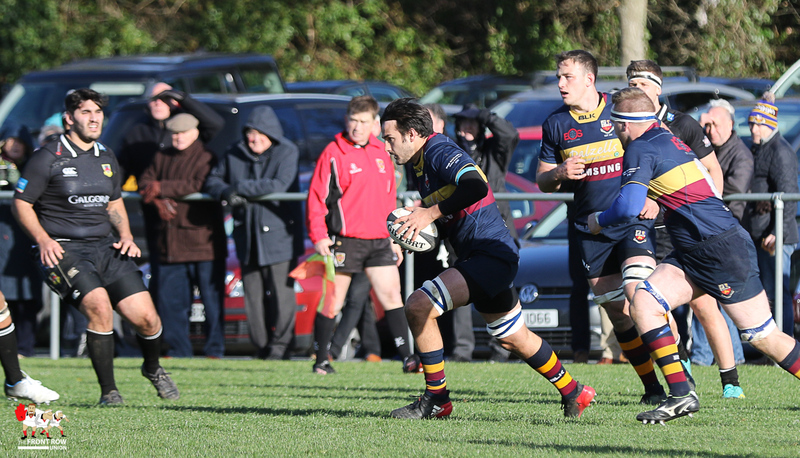 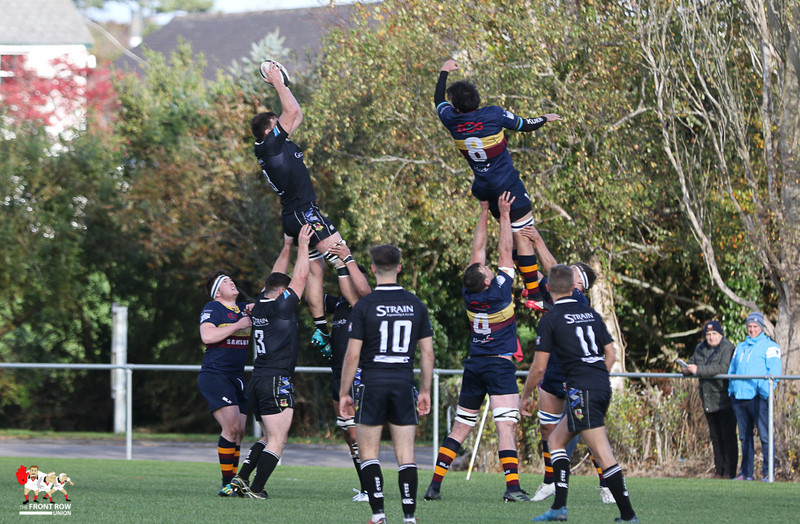 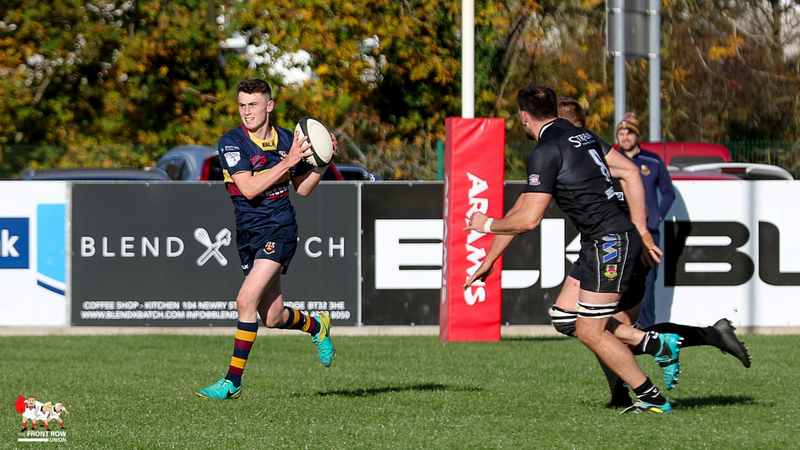 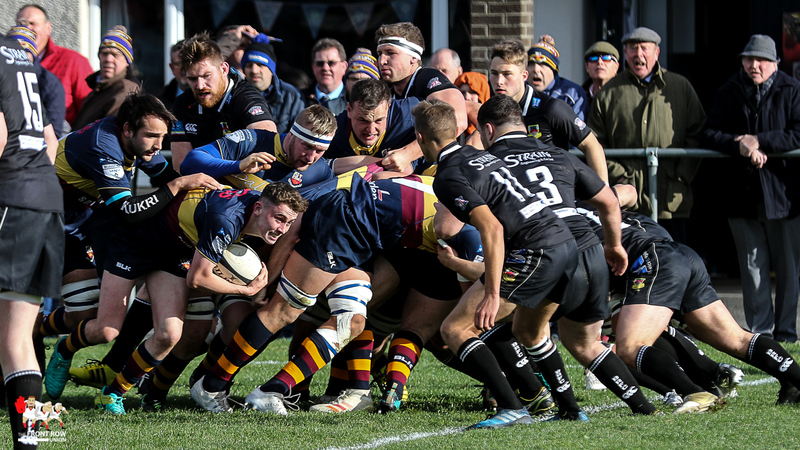 Banbridge roared to the top of AIL 1B with a bonus point win against Ballymena at Rifle Park on Saturday afternoon. 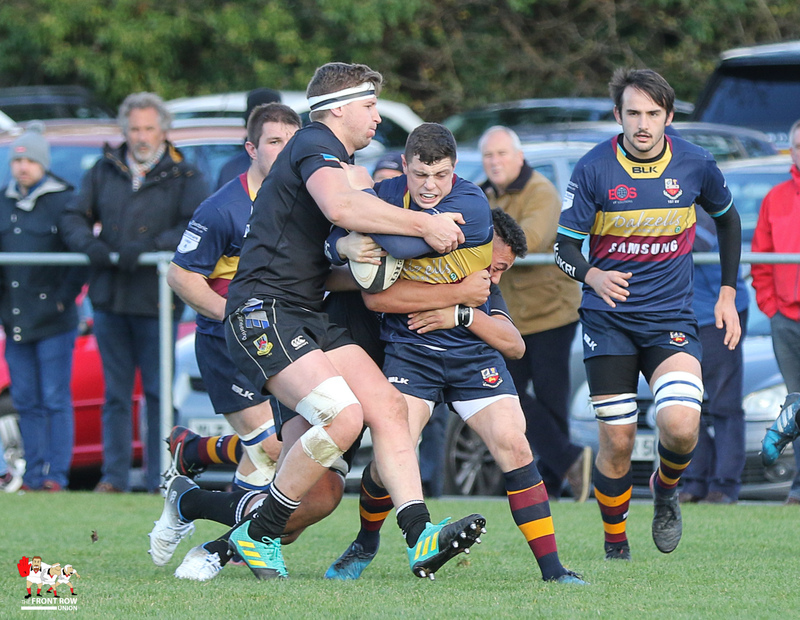 The home side had the upper hand for the bulk of the match though it was the visitor’s who initially set the pace as they enjoyed territory and possession for the opening ten minutes. 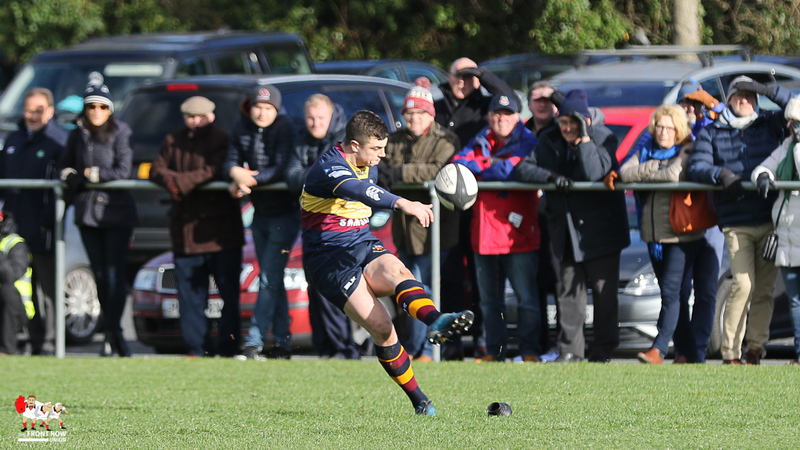 The Banbridge defence held firm and they counter punched with accuracy with Stevie Irvine going over after a couple of darts at the line. 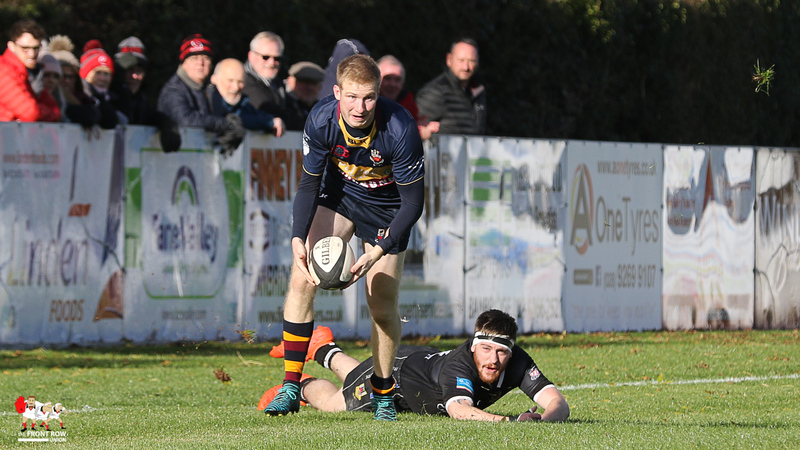 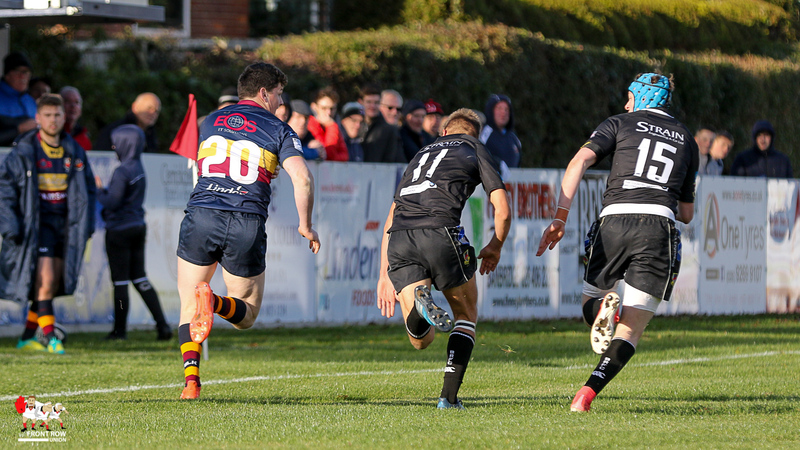 Adam Doherty converted to give the hosts a 7 – 0 lead and the full back followed up with two successful penalties to stretch the lead to 13 – 0 by the end of the first quarter. 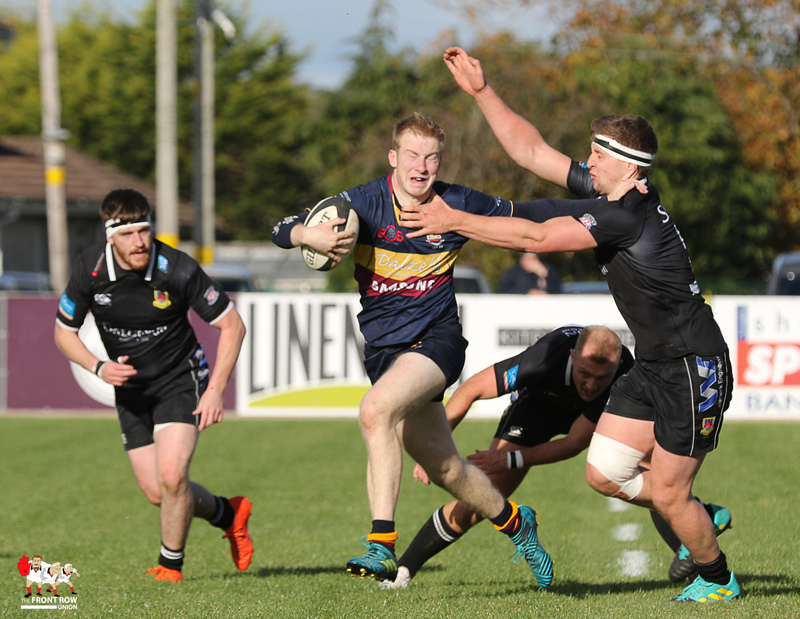 The teams swapped penalties, with Ballymen’s Tim Small matching Doherty, in a tense second quarter that only really sprung to life in the closing minutes with Ballymena’s Stephen Mullholland yellow carded. 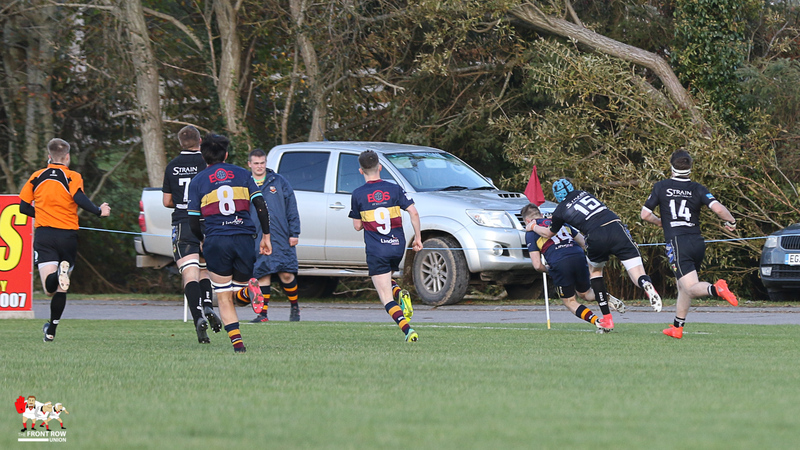 Ban responded immediately and some nice midfield exchanges left wing forward Mike Bentley bearing down on the line. 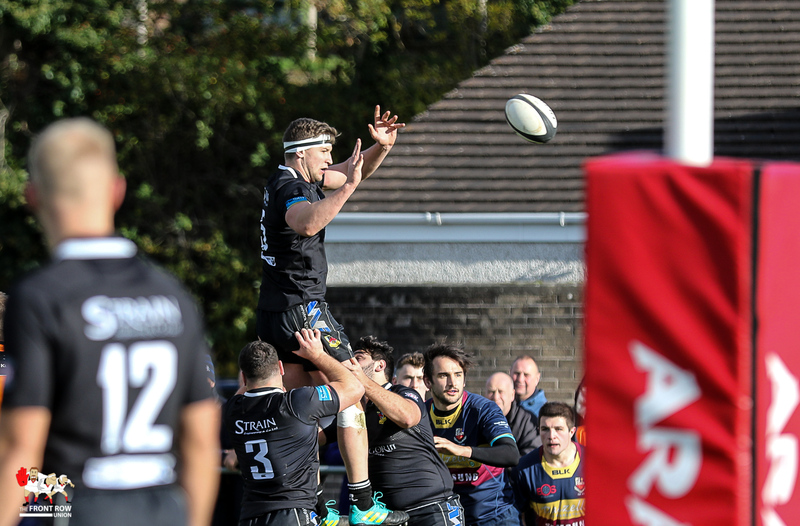 The scrambling Ballymena defence managed to hold him up and the referee blew for half time. 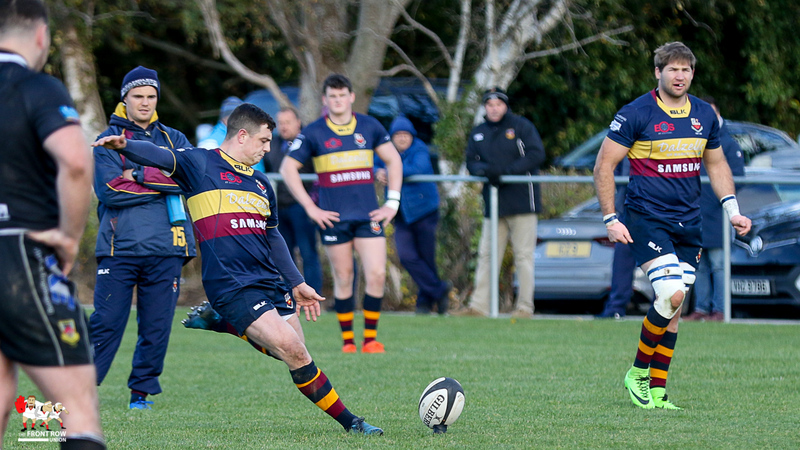 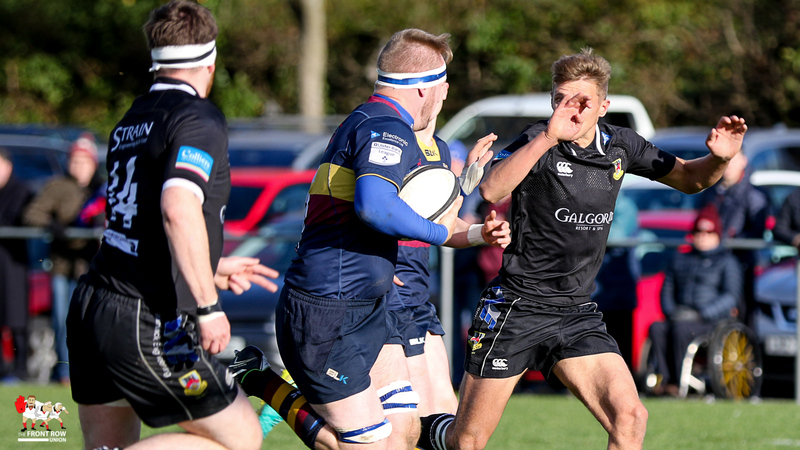 Clive Ross was carded for Ballymena soon after the restart and with the visitors down to 13 men the home side took full advantage with Doherty knocking over his 4th penalty before Conor Field crossed out wide to take the score to 24 – 3. 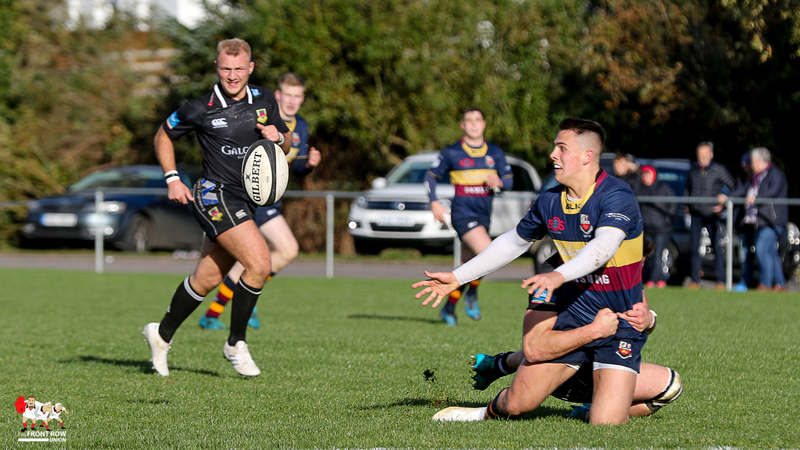 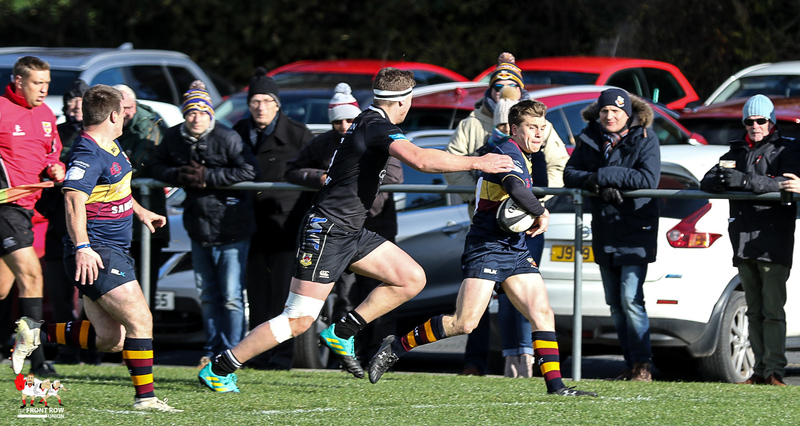 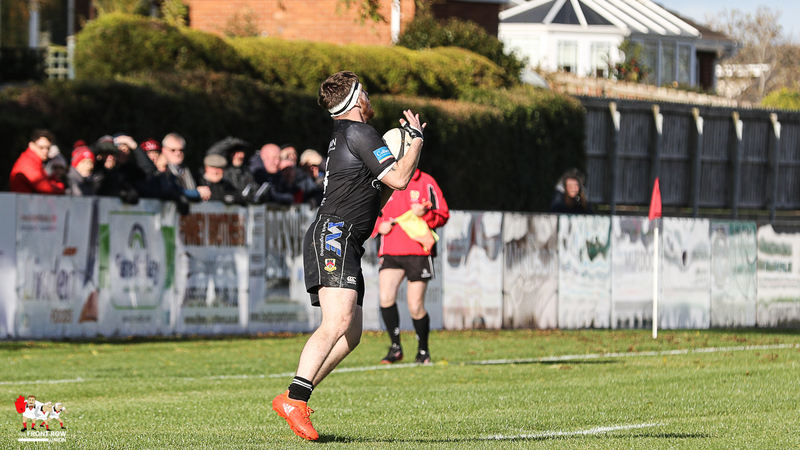 Niall Armstrong and Aaron Kennedy crossed in the final quarter to wrap up the game for Banbridge before Ballymena finally got over the line with the last play of the game, Connor Smyth touching down. 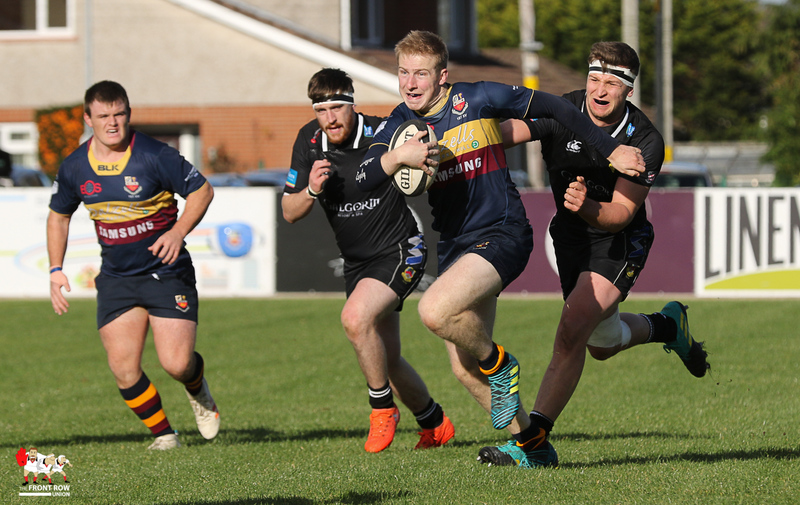 BANBRIDGE: Adam Doherty; Conor Field, Andrew Morrison, James Hume, Adam Ervine; Jonny Little, Niall Armstrong; Corrie Barrett, Peter Cromie (capt), Stuart Cromie, Alex Thompson, Chris Allen, Mike Bentley, Caleb Montgomery, Stevie Irvine. 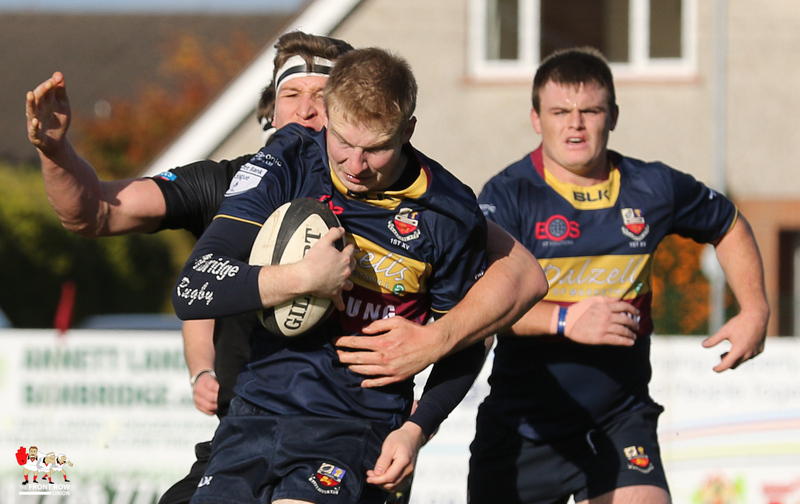 Replacements: Ross Haughey, Andrew Jackson, Matthew Laird, Aaron Kennedy, Benjamin Carson. 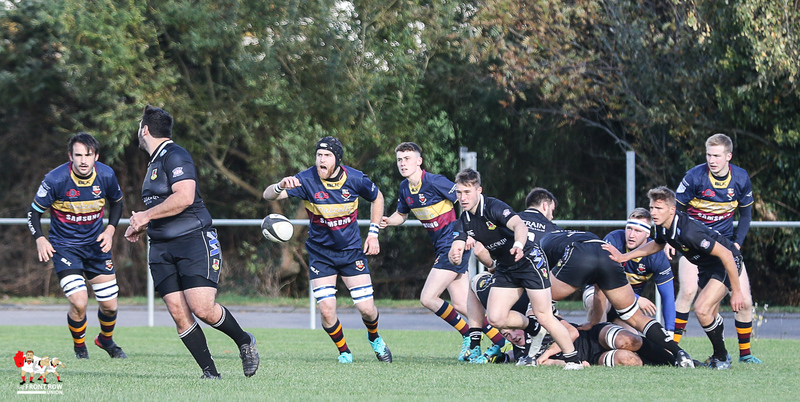 BALLYMENA: Matthew Norris; Jonny McMullen, Darrell Montgomery, Glenn Baillie, Mark Thompson; Tim Small, Michael Stronge; Nacho Cladera Crespo, Jonny Spence, Chris Cundell, David Whann, JJ McKee, Clive Ross, Marcus Rea, Stephen Mulholland. 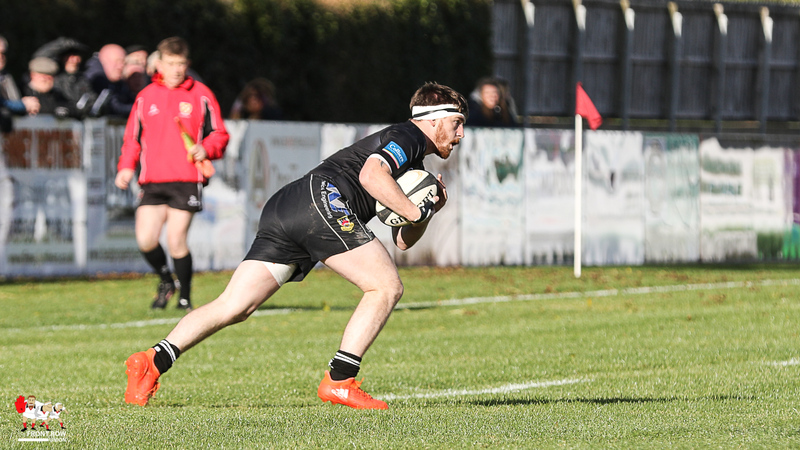 Replacements: James Taggart, Josh Bill, Connor Smyth, James Wheeler, Dean Reynolds.